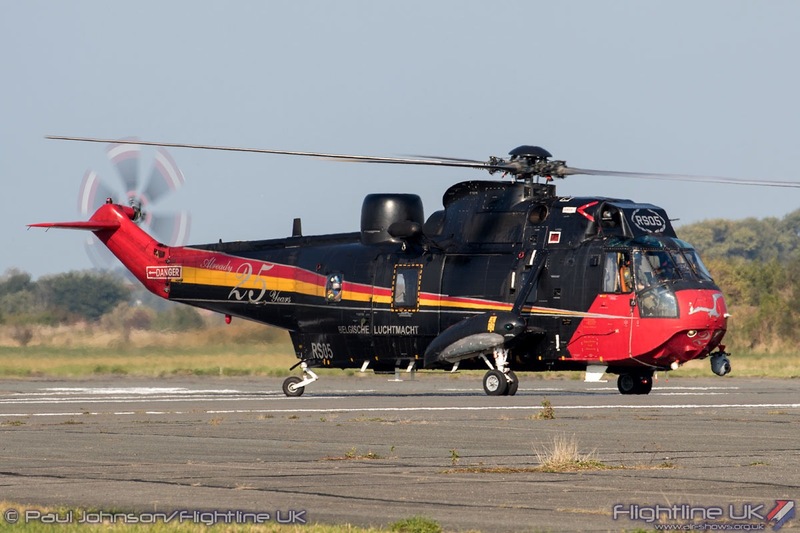 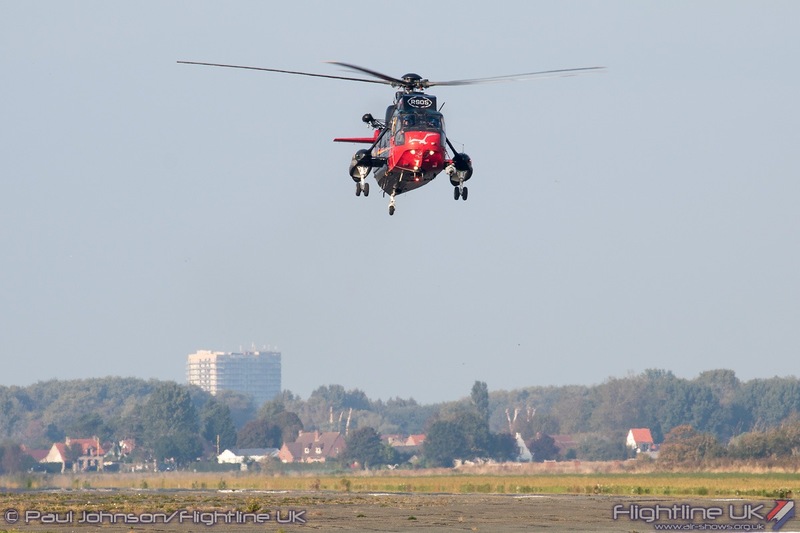 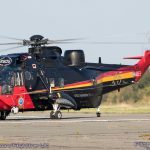 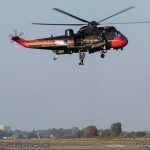 No 40 Squadron of the Belgian Air Force played host to the 2016 edition of the International SAR Meet at Koksijde Air Base. 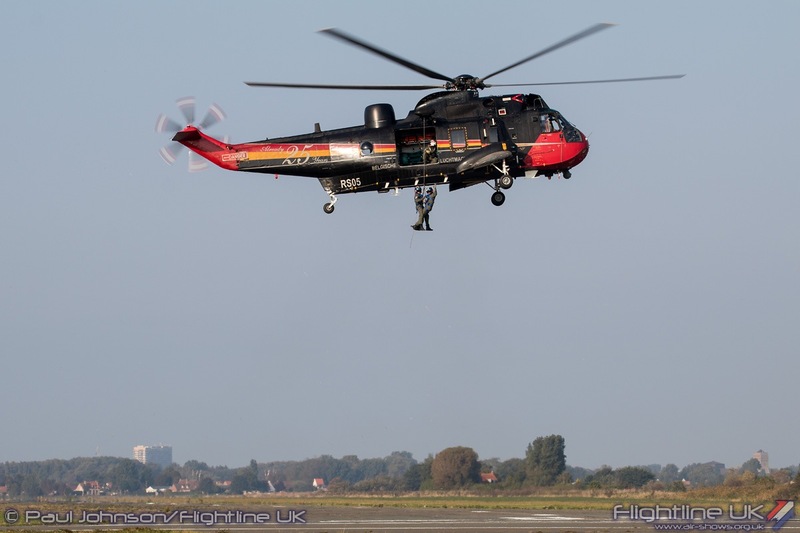 The meet brings together various Search and Rescue helicopter units from across Europe for a competitive exercise testing various skills required by SAR crews. 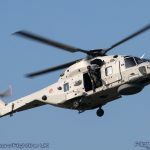 On the second day of the Exercise, 40 Squadron kindly opened the gates of Koksijde for a Spottersday allowing 400 enthusiasts a special chance to photograph the participating aircraft. 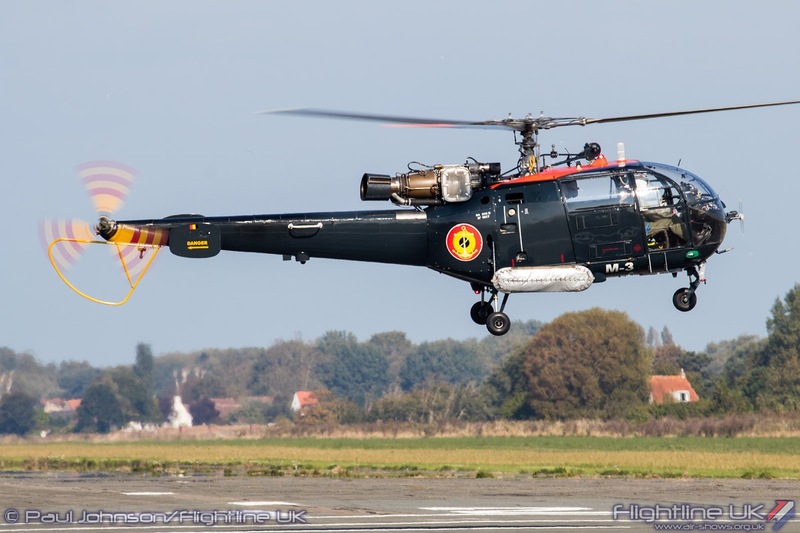 2016 is a special year for the Belgian Air Force which is celebrating its 70th Anniversary. 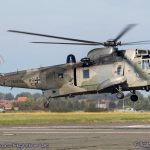 However, the Air Force is celebrating other important milestones this year and 2016 also marks 45 Years of service for the Sud-Aviation SA316B Alouette III plus 40 years of Westland Sea King operations. 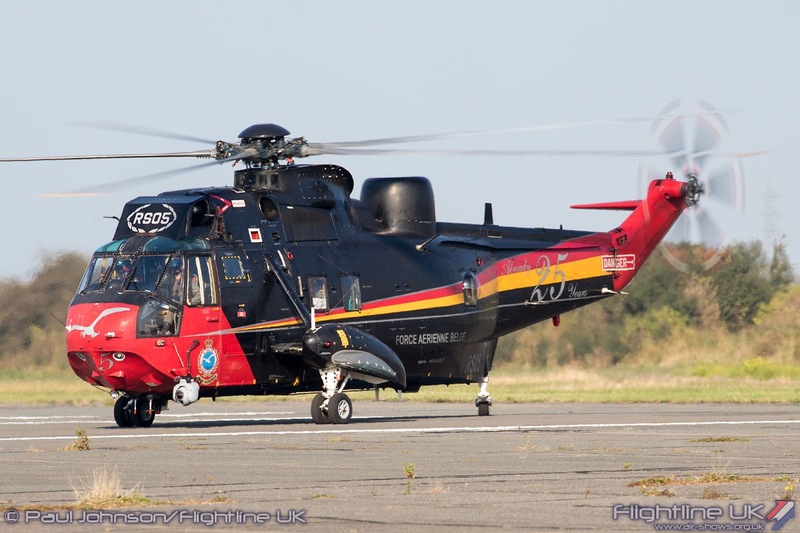 Both types are operated from Koksijde Air Base by 40 Squadron. 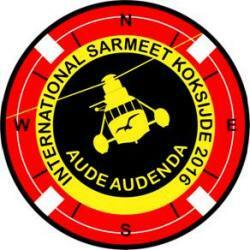 It was therefore fitting that the unit held the latest edition of the International SAR Meet. 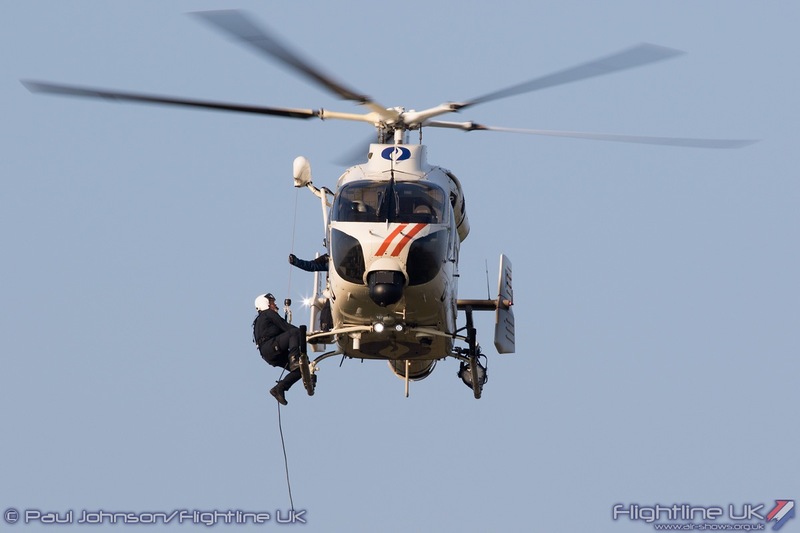 Search and Rescue units are not often seen at public events as they are almost constantly on duty. 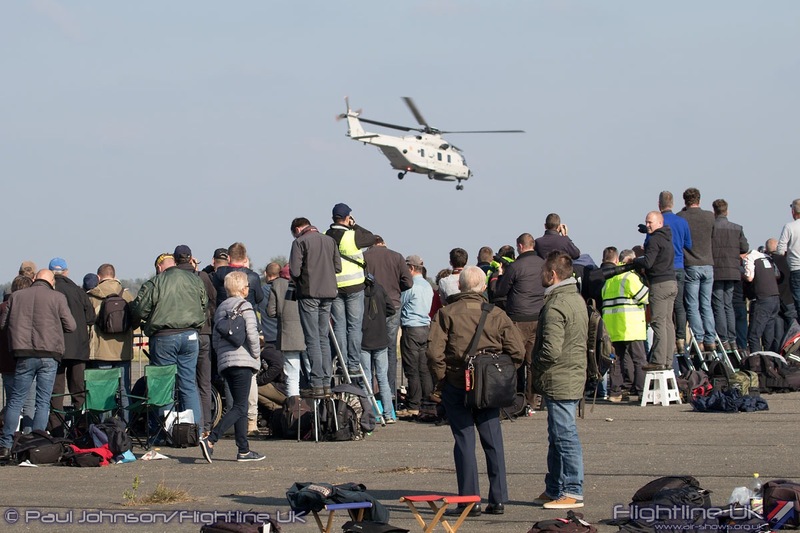 Therefore, the addition of a Spottersday was of great interest to enthusiasts as it was a rare chance to get close to some rare helicopters. 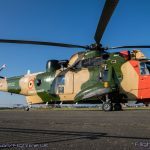 The initial list of participating nations and helicopters was very impressive with the likes of France, Portugal, Norway, Latvia and the Netherlands all intended to be part of the Meet. 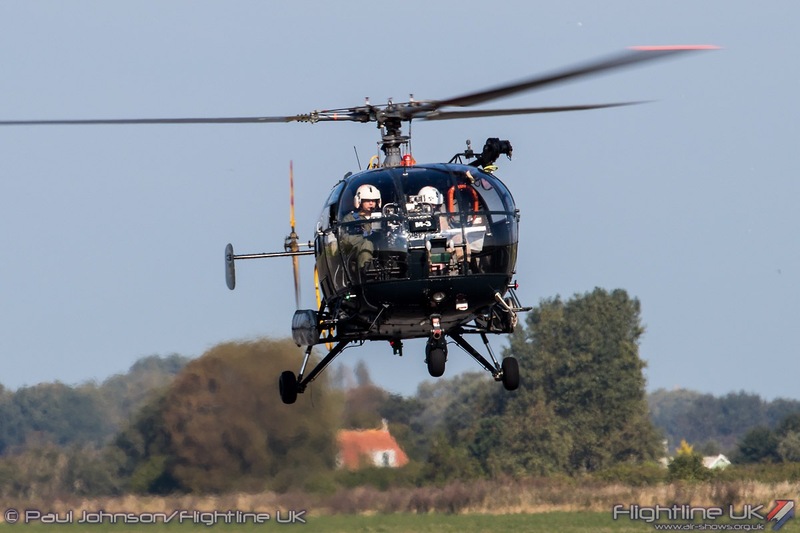 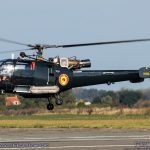 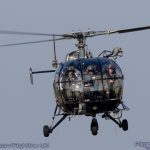 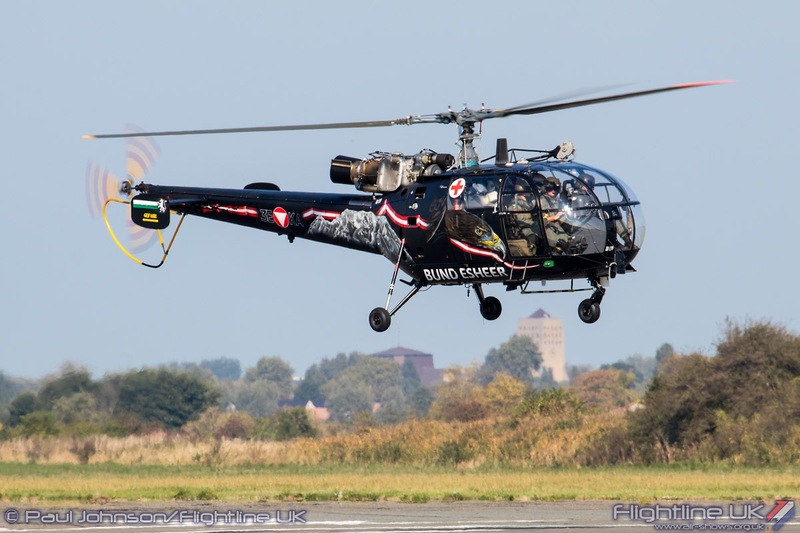 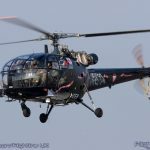 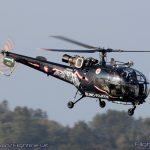 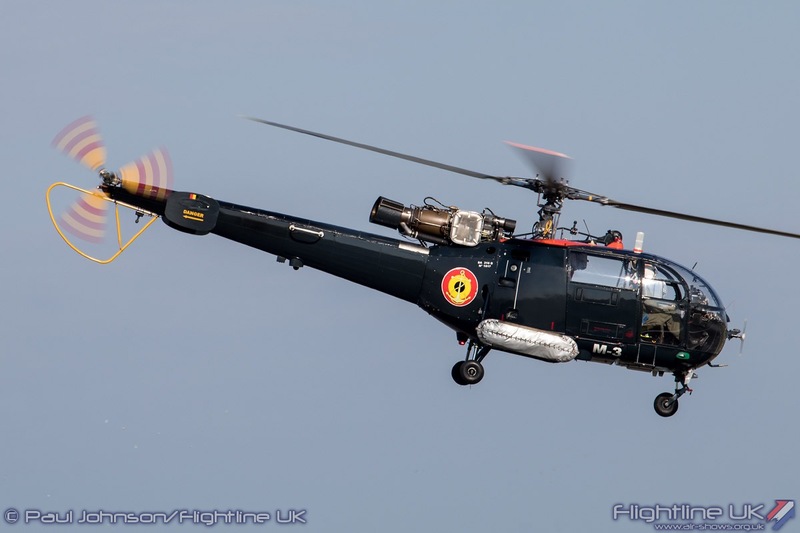 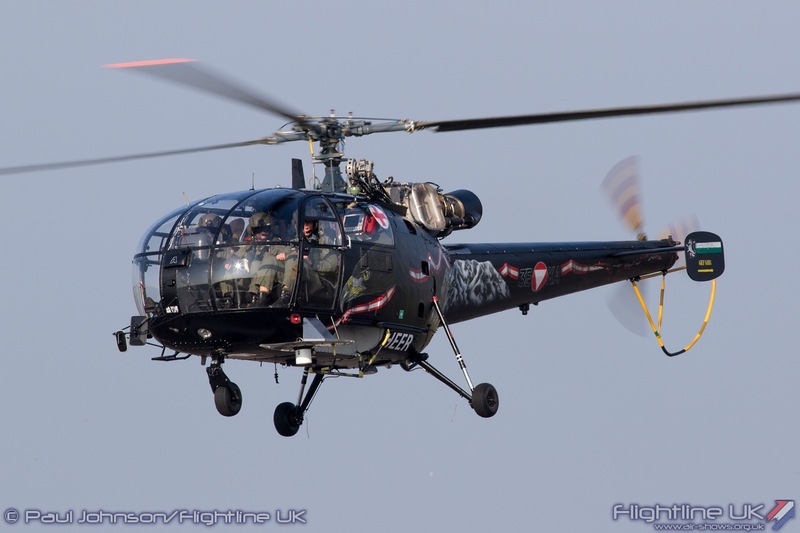 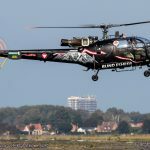 Sadly for the host unit, organisers and enthusiasts a flurry of cancellations just left helicopters from Belgium, Austria, Germany and Poland planning to attend the event. 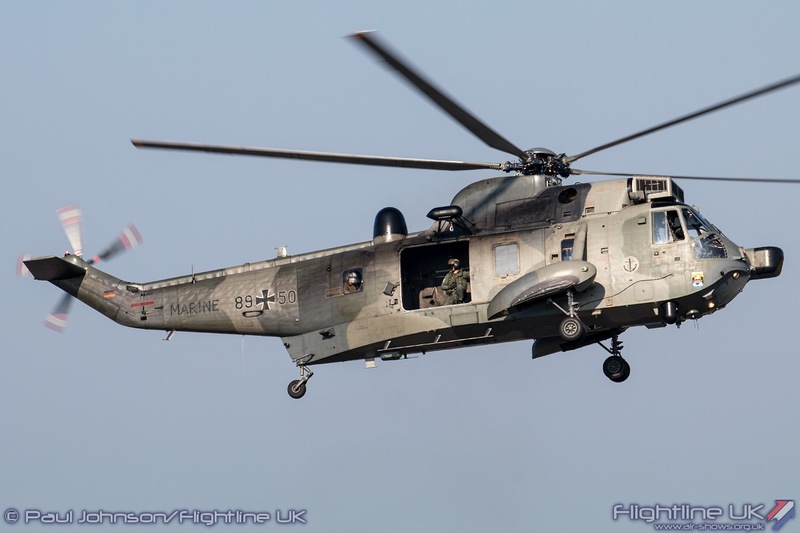 The Polish did send a Mil Mi-8 Hip to the event but it was called back while transiting through Germany. 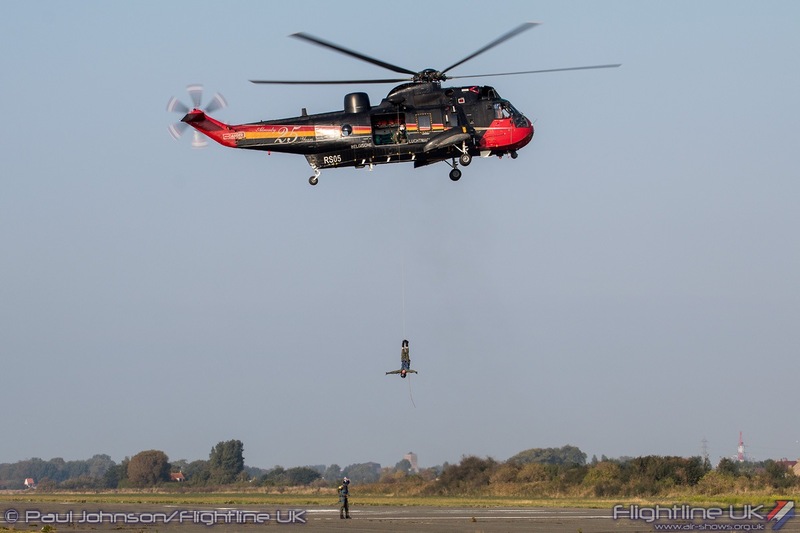 The exercise did not just involve flying for the crews. 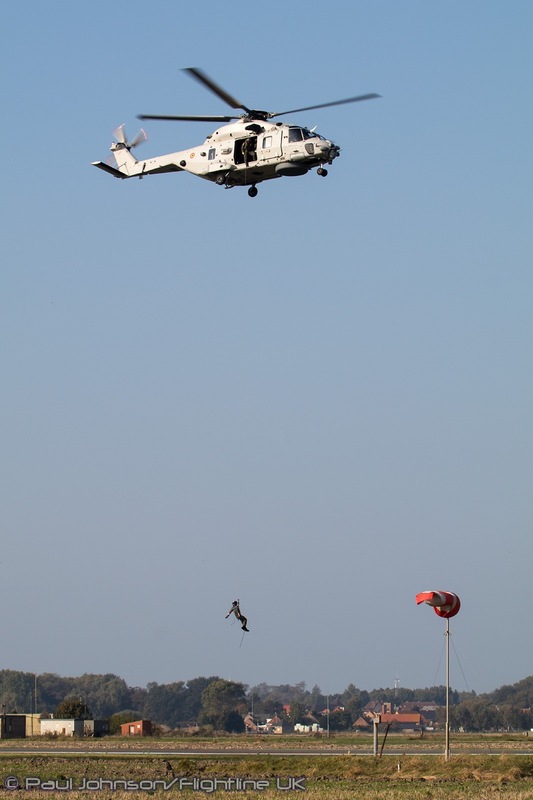 Survival and winching exercises took place at Koksijde’s beachfront swimming pool plus there were more light-hearted elements for the crews including a Highland Games competition and an International Evening allowing crews to experience the different cultures and cuisines of the participating nations. 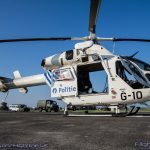 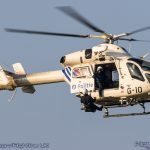 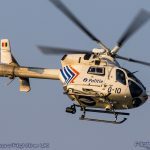 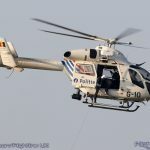 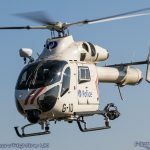 The Spottersday was held on the southern side of the massive Koksijde Air Base providing near perfect photographic conditions for the gathering of enthusiasts. 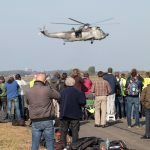 It is important at this stage to stress that the event was not an airshow or public event by any means and there were really only very basic facilities. 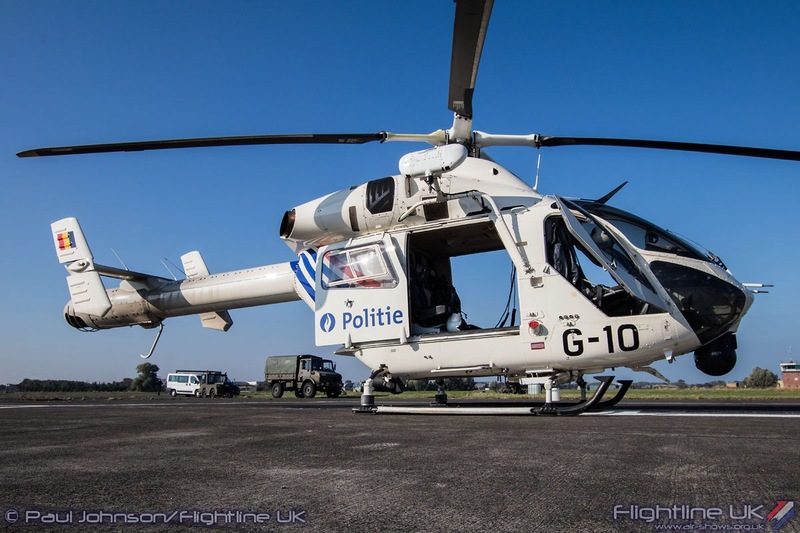 However, the Belgian Air Force organisers did make it as special day as possible for the visitors. 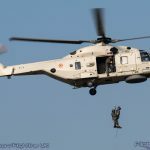 For the very reasonable admission charge of €20 not only did visitors gain access to the event, but were also greeted by a goody bag with a commemorative T-shirt, SAR Meet Patchs, Challenge Coin plus stickers highlighting not only SAR Meet but also the Sea King and Alouette anniversaries. 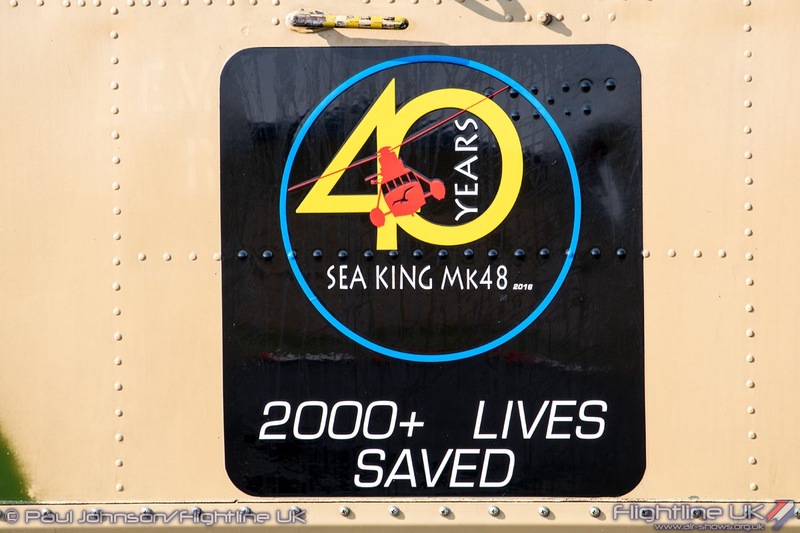 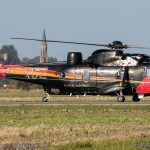 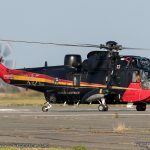 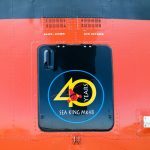 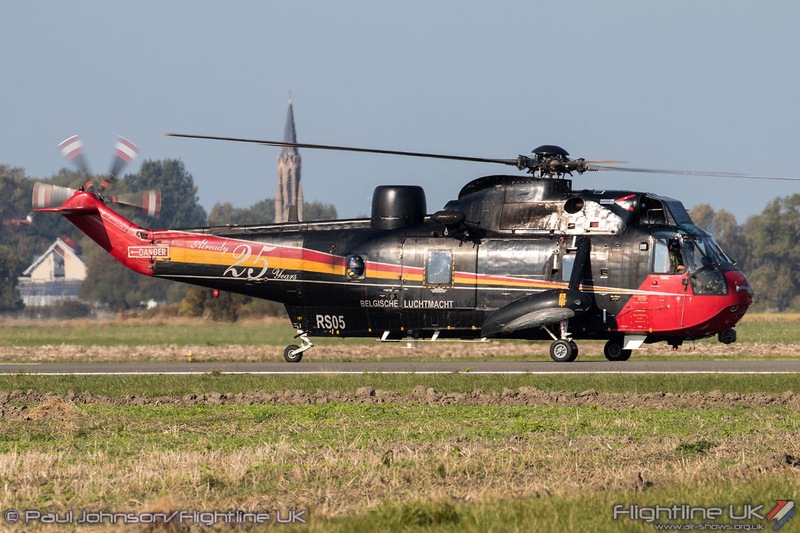 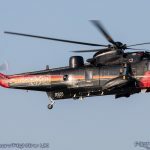 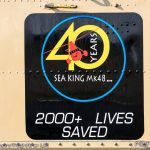 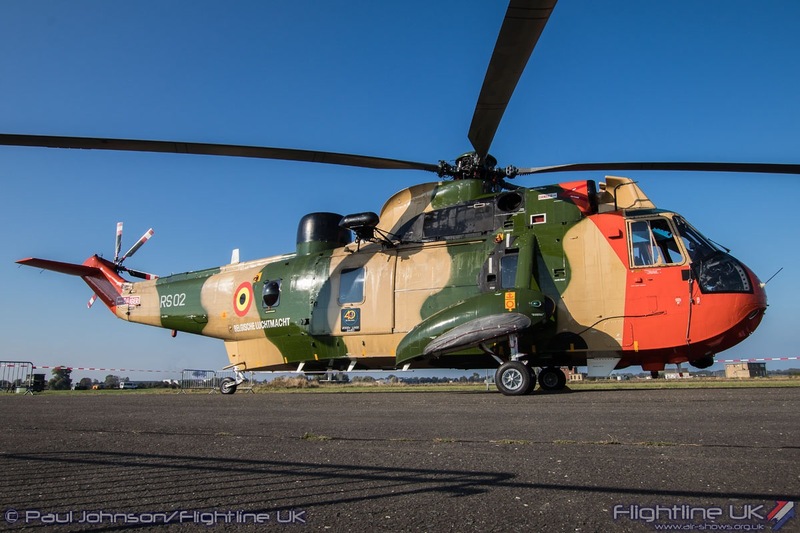 At the centre of the Spotter’s area was one of the Belgian Air Force’s Westland Sea King Mk48s, RS03, wearing specially painted panels celebrating 40 years of service and also over 2000 lives saved by the unit. 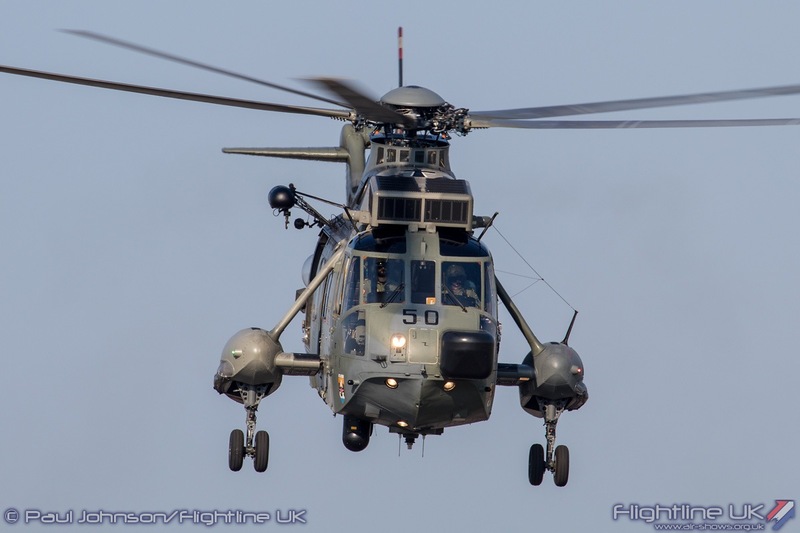 Belgium’s Sea Kings will remain in service until 2018 so are in the twilight of their operational career. 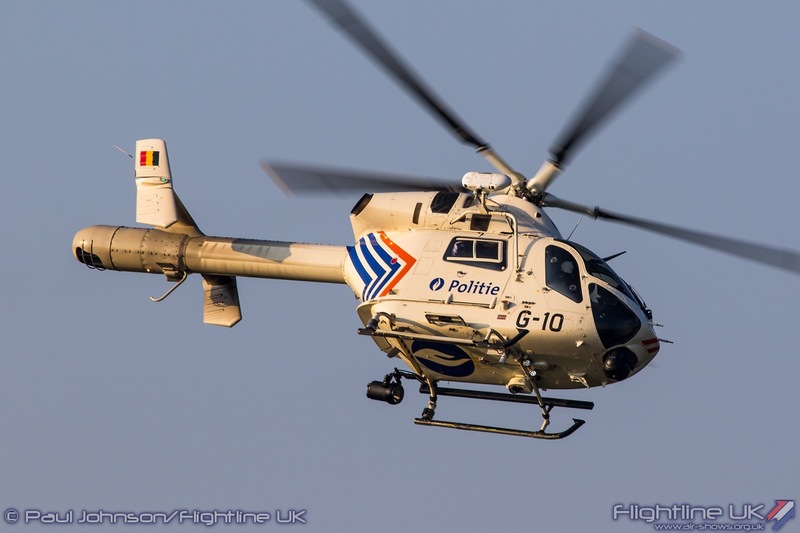 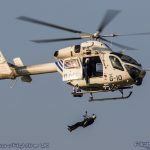 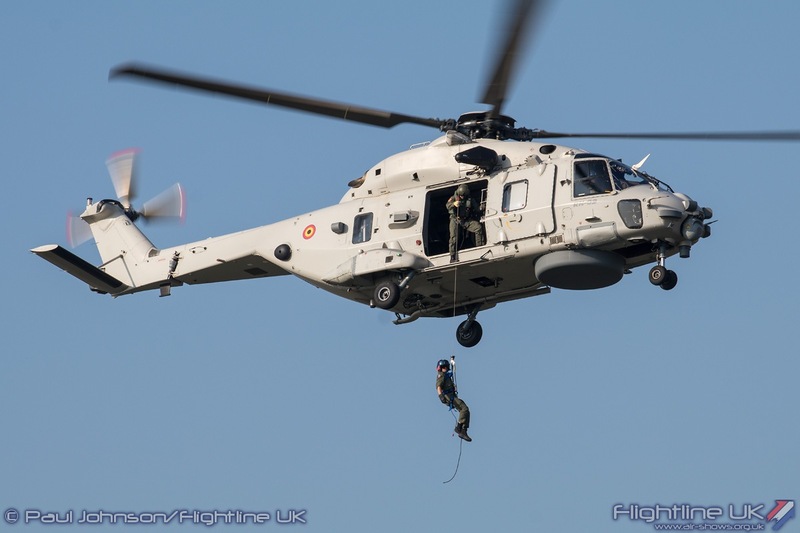 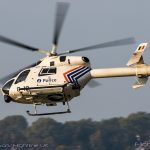 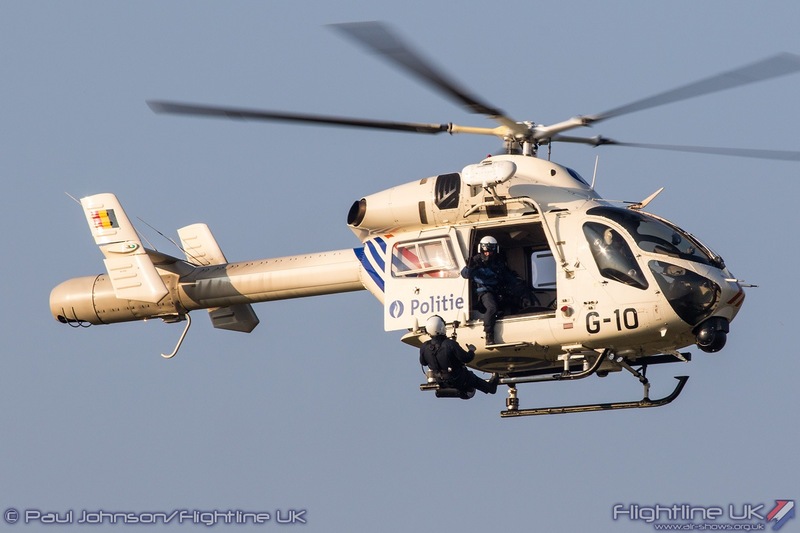 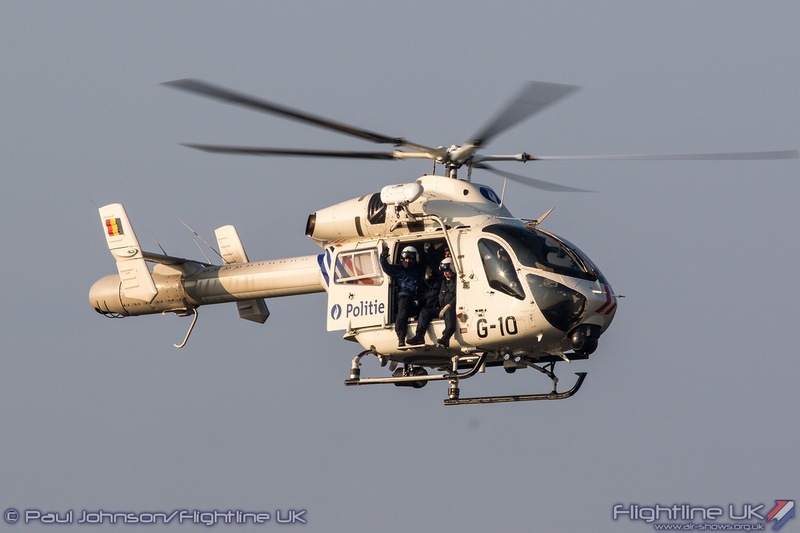 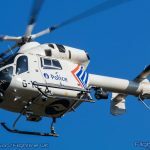 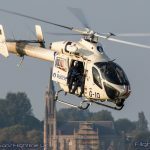 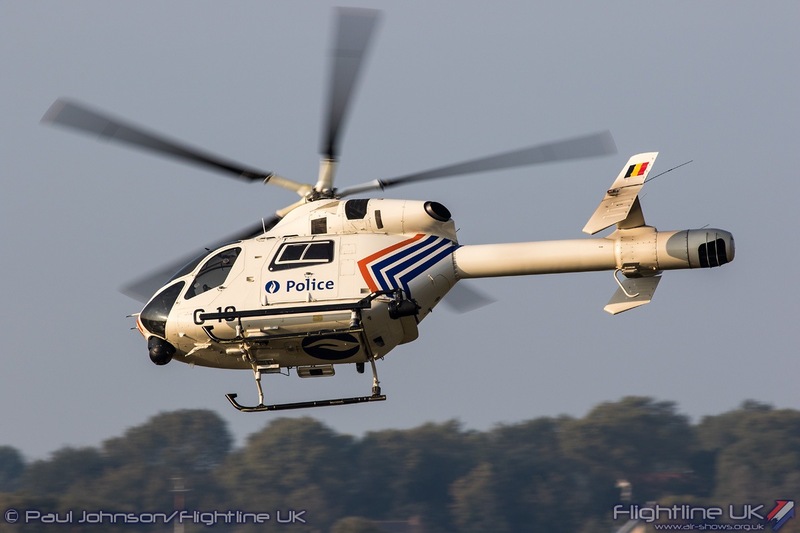 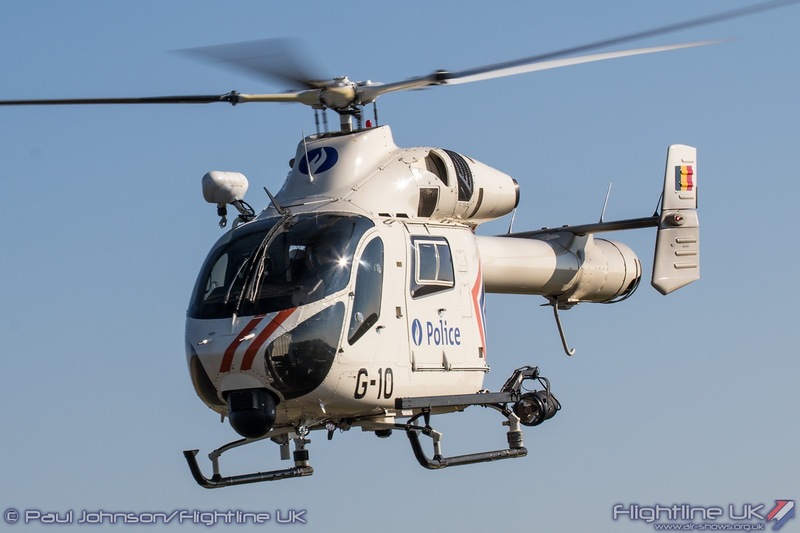 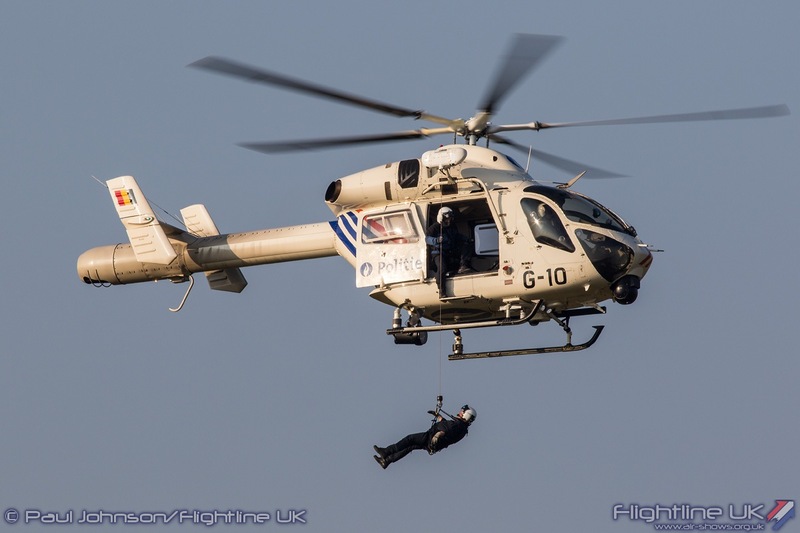 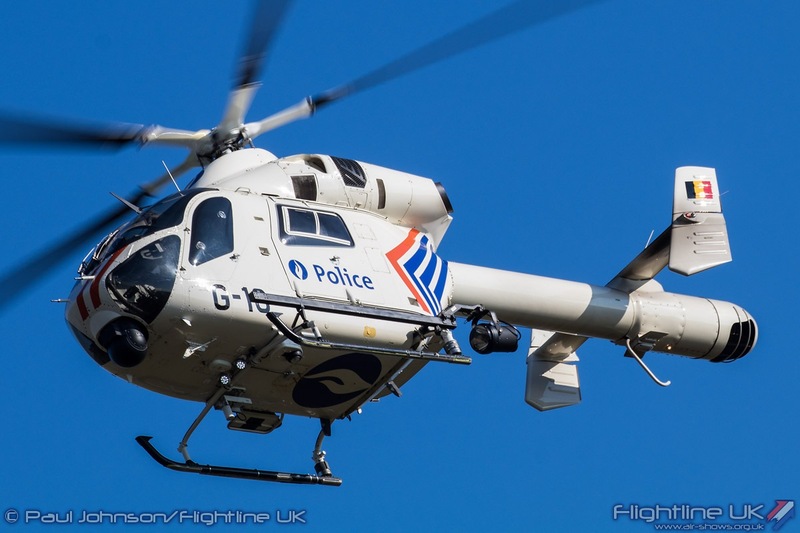 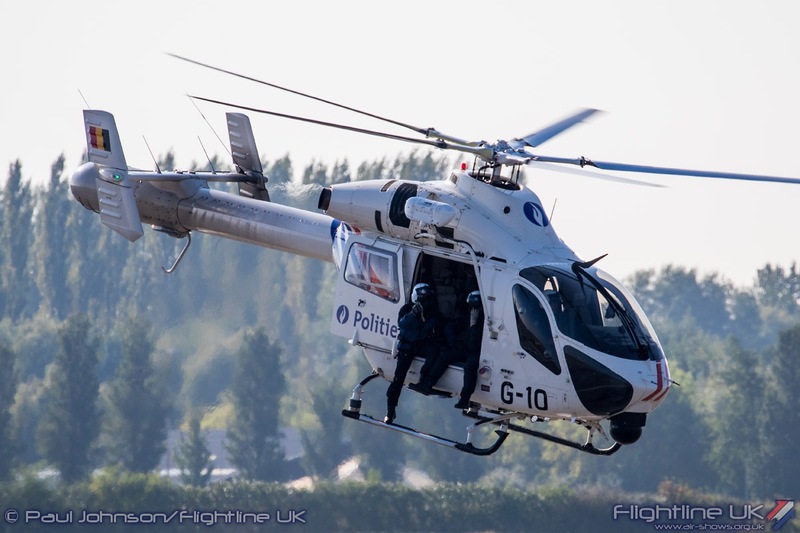 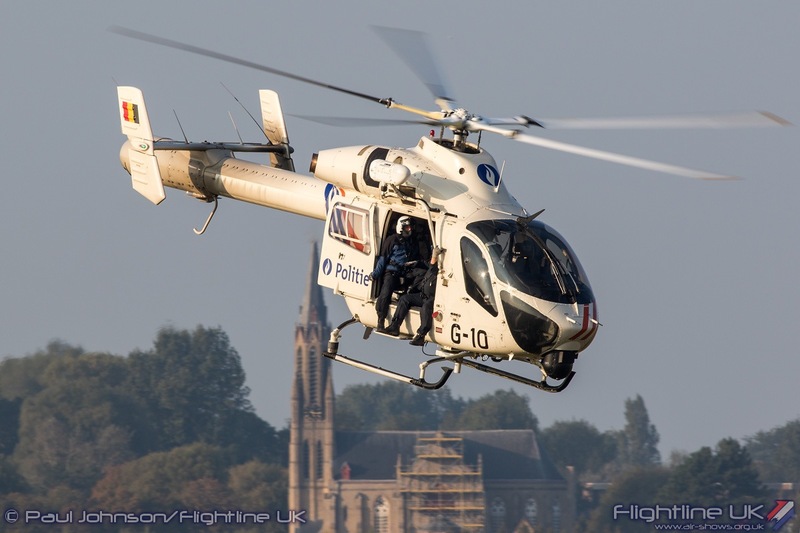 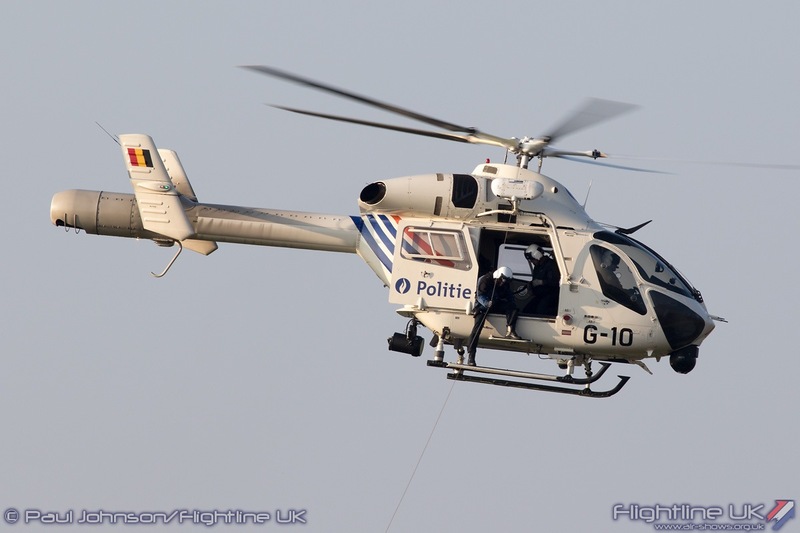 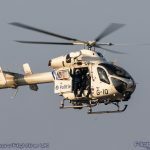 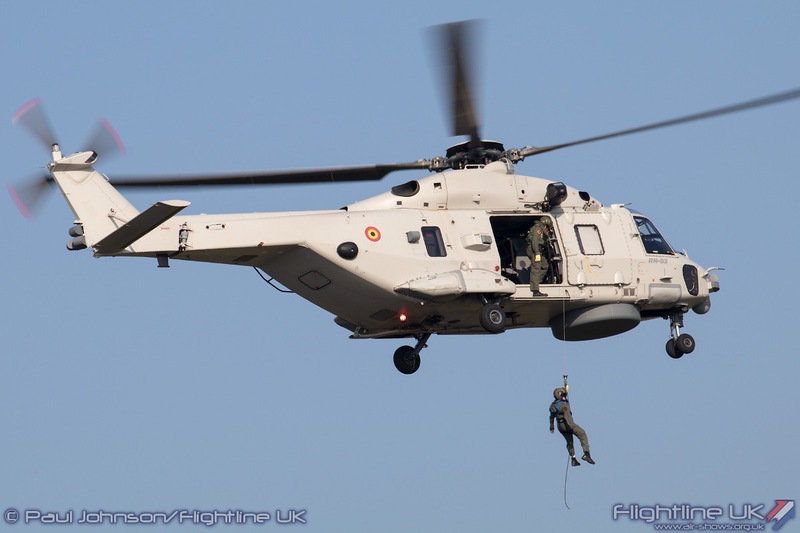 Behind the Sea King was the only ‘civilian’ participant, the Belgian Police Service’s MD Helicopters MD900 Explorer. 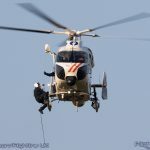 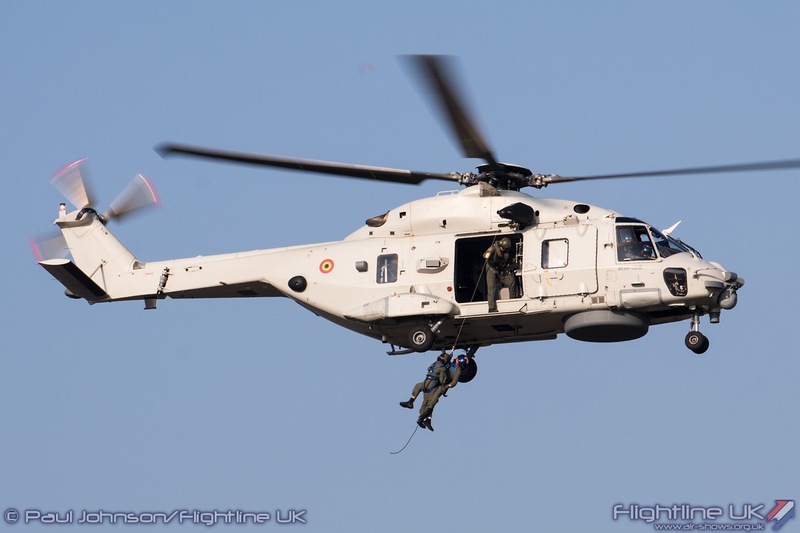 Though it was not a formal part of the SAR Meet Exercise, the MD900 crew did perform two Search and Rescue demonstration around the Spotters Area. 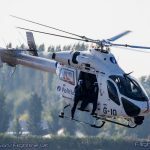 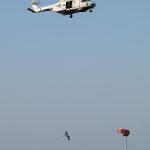 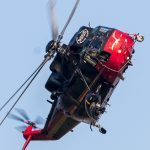 As this was not a formal public airshow, the crew were able to perform very close in to the spectators giving some very dramatic views as the crews performed winching operations and fast passes. 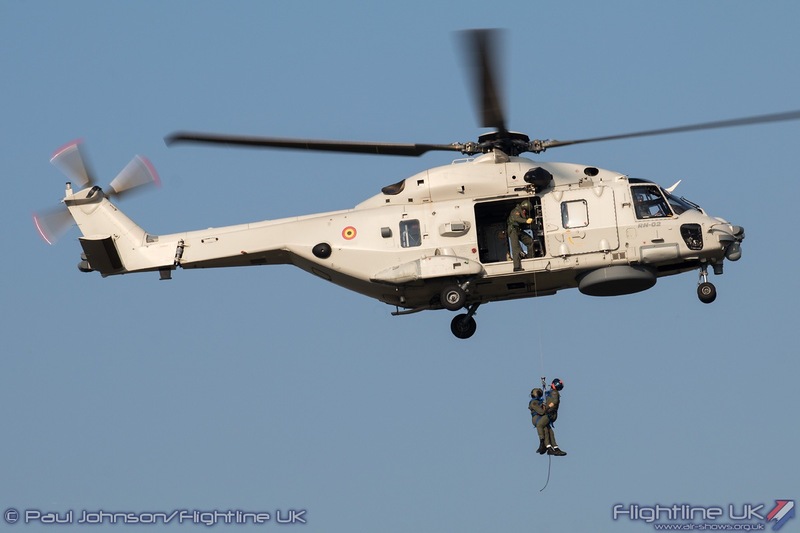 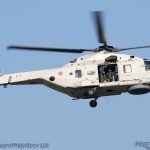 The Spottersday coincided with the first major flying task of the SAR Meet exercises. 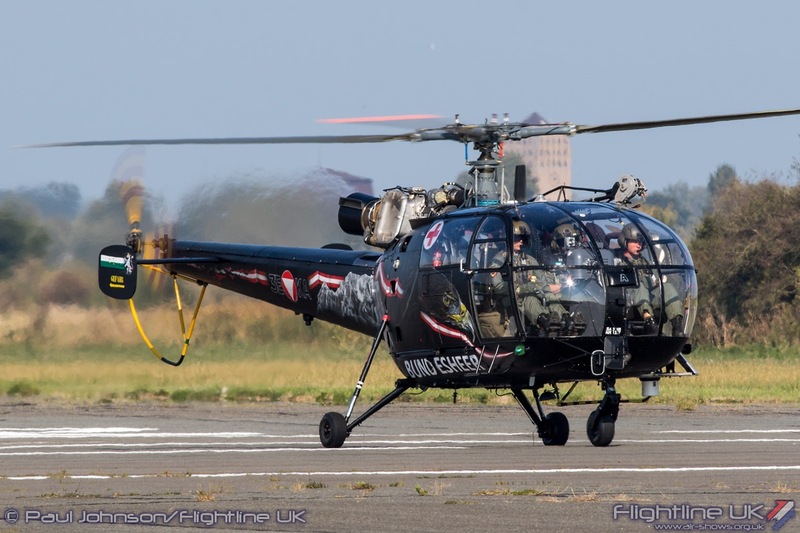 This was a navigation task which saw all the participants fly out of the base at regular intervals flying through various waypoints before returning to base at set times. 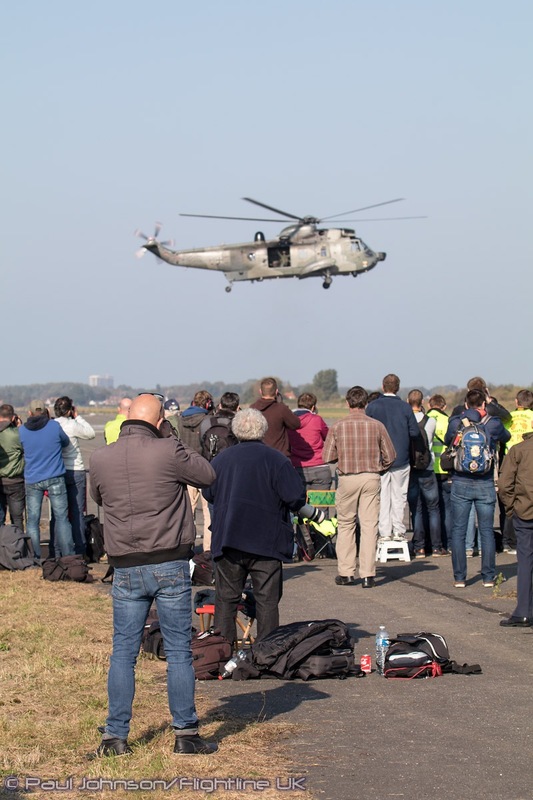 All of the aircraft started from a point just in front of the enclosure. 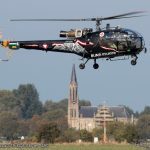 Prior to departure all of the participants posed their aircraft at various angles for photographs against the backdrop of the town of Koksijde. 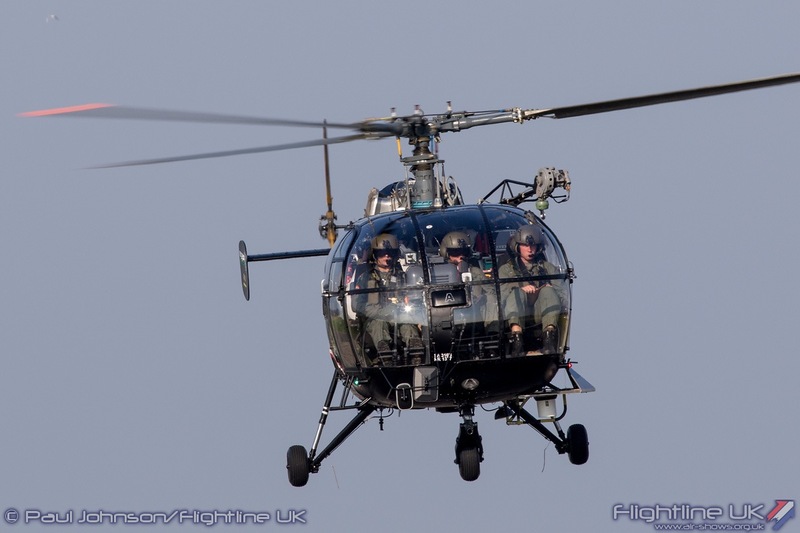 First to go was part of the home team, the Sud-Aviation SA316B Alouette III. 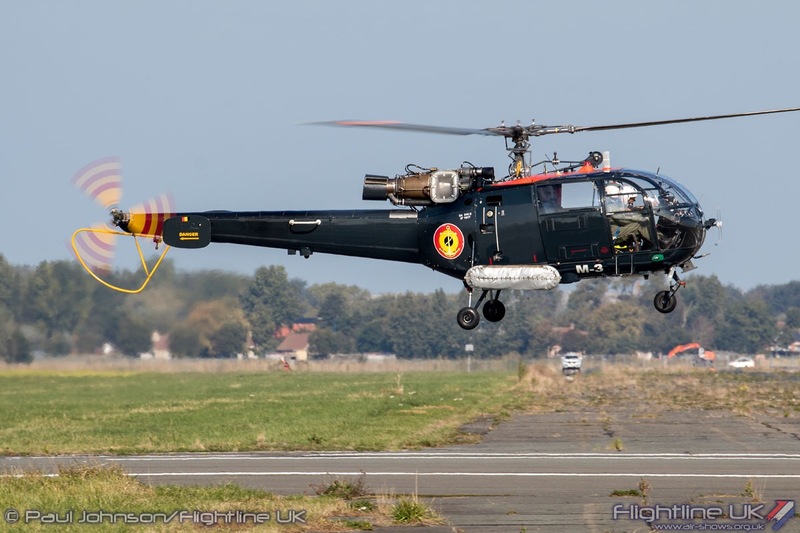 These aircraft have served with the Belgian Navy and COMOPSAIR for 45 years operating off Belgian Navy Frigates. 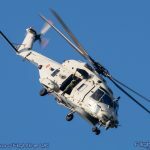 Now they are part of 40 Squadron’s Marine flight. 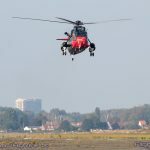 Recently they have been used in Belgian Anti-Piracy and Anti-Narcotic operations but can also perform some Search and Rescue duties. 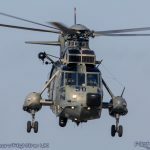 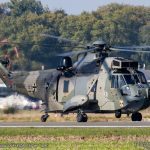 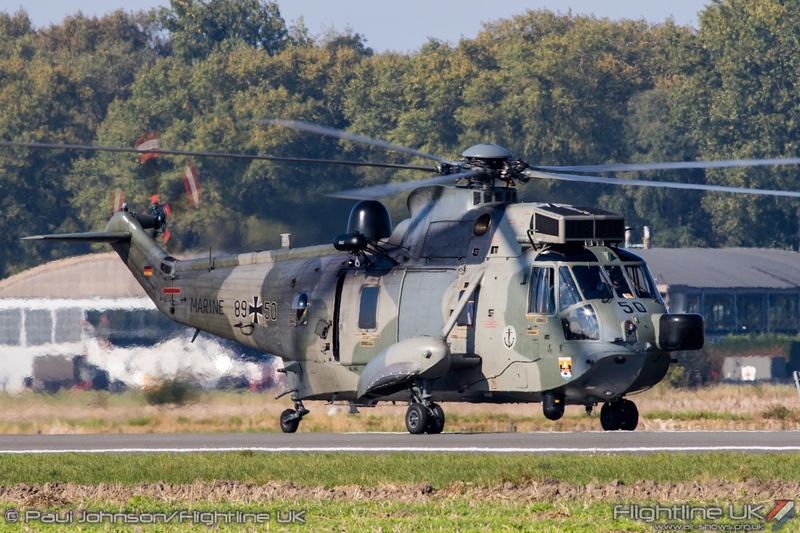 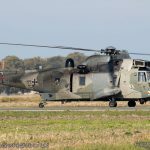 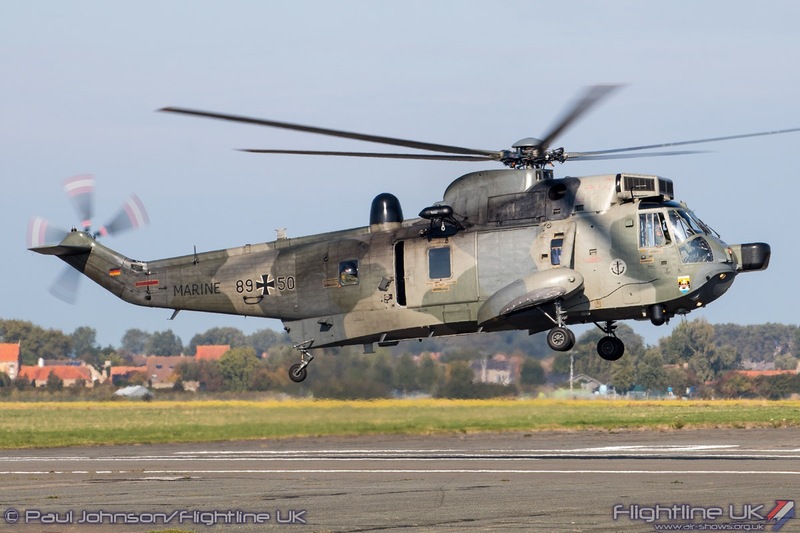 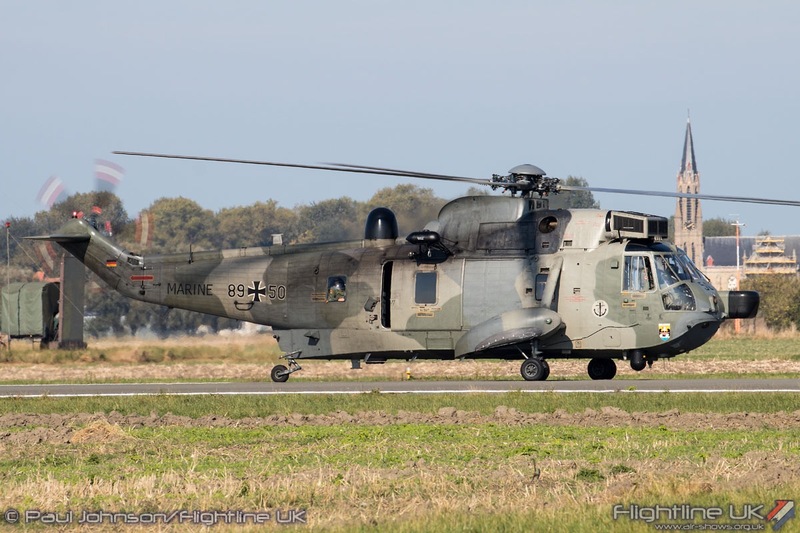 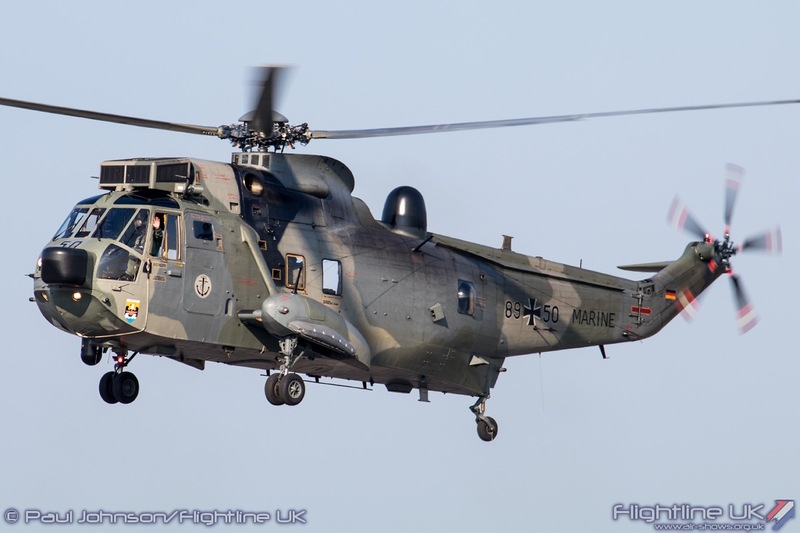 First of the visiting helicopters to fly during the afternoon was the Westland Sea King Mk41 of the German Navy. 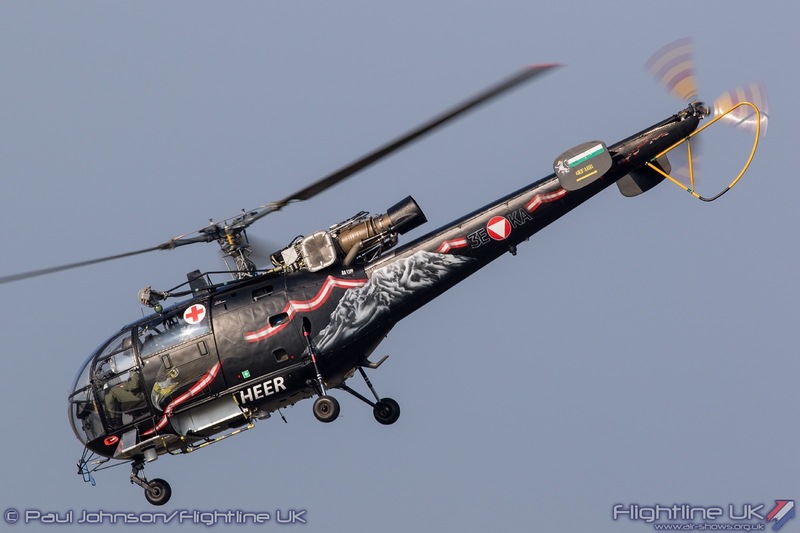 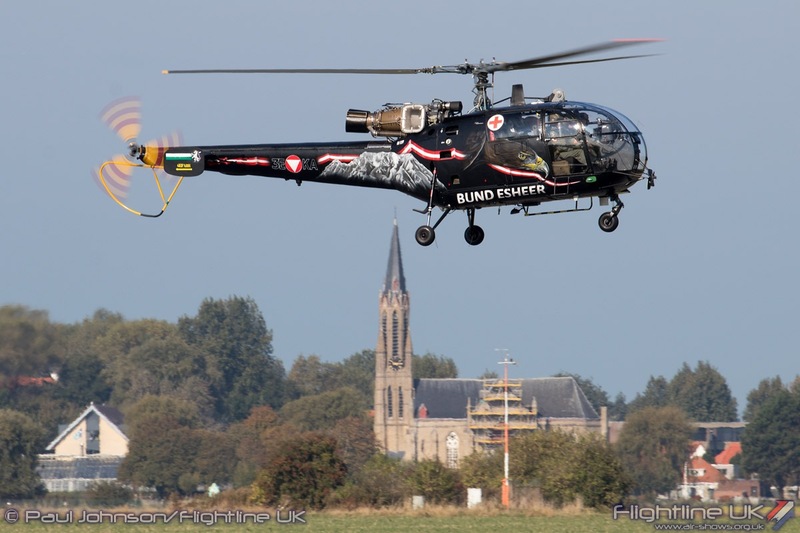 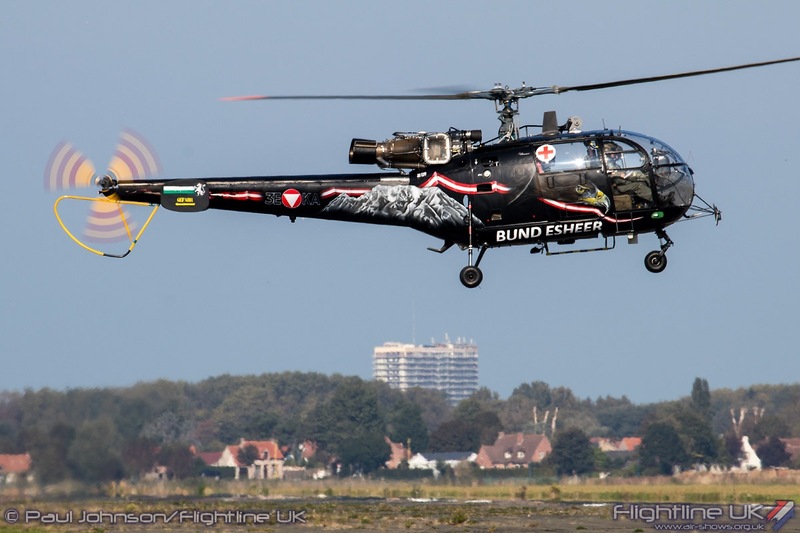 This aircraft came from Marinefliegergeschwader 5 based at Nordholz who be the hosts of the next SAR Meet. 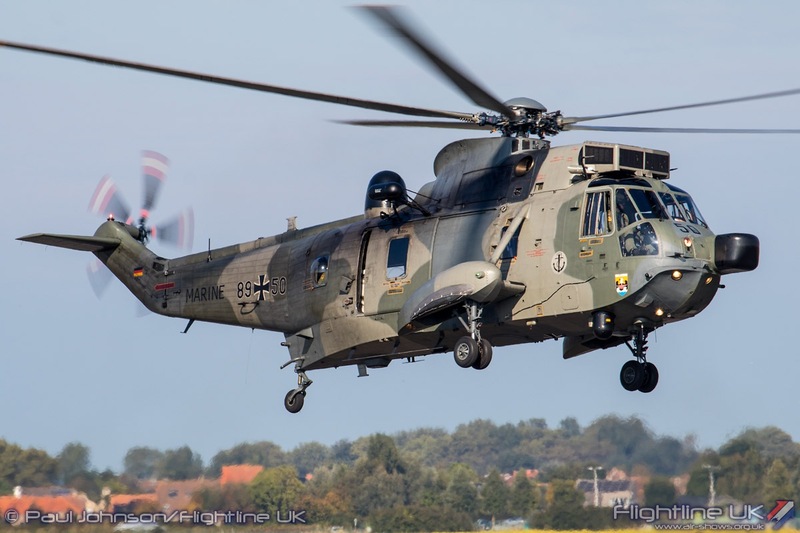 German Sea Kings are used on a variety of missions including maritime reconnaissance, tactical transport, disaster relief and Search and Rescue. 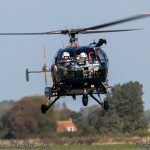 On return to Koksijde, the crew made some very welcome further flypasts for the photographers as well as a very nice bow before returning to the SAR Meet apron. 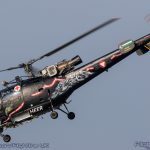 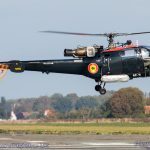 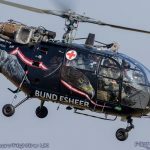 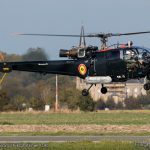 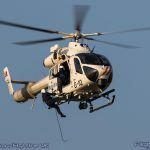 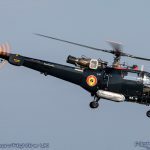 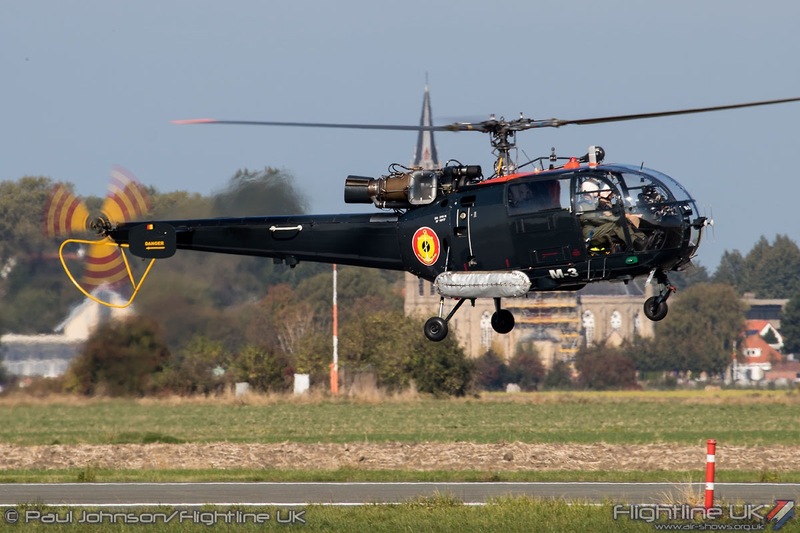 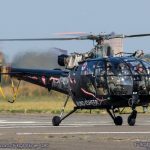 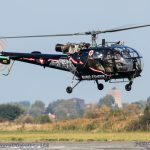 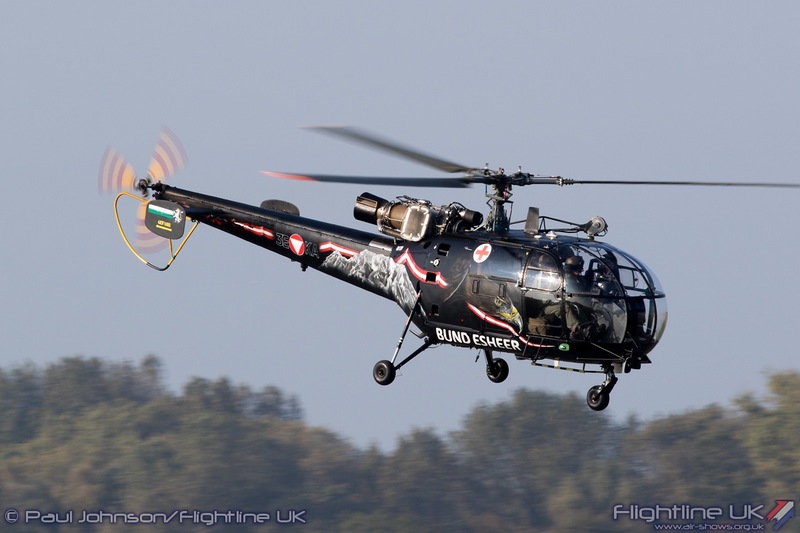 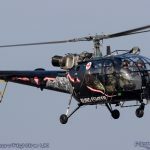 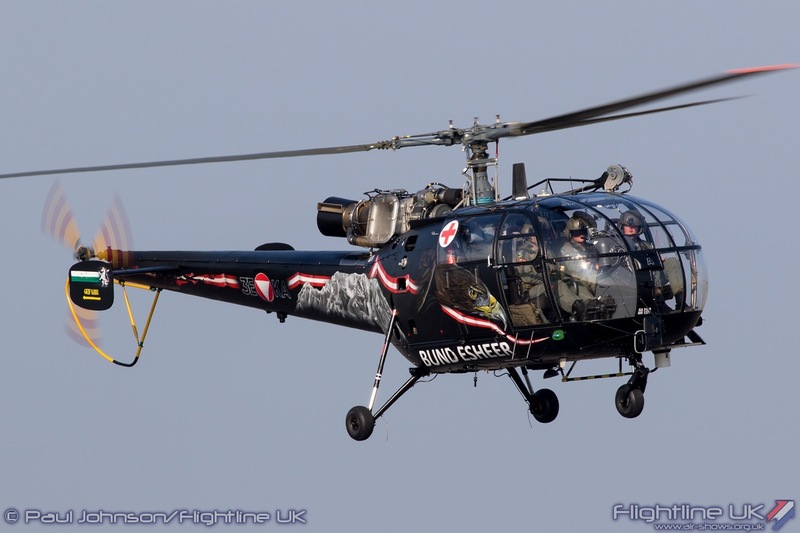 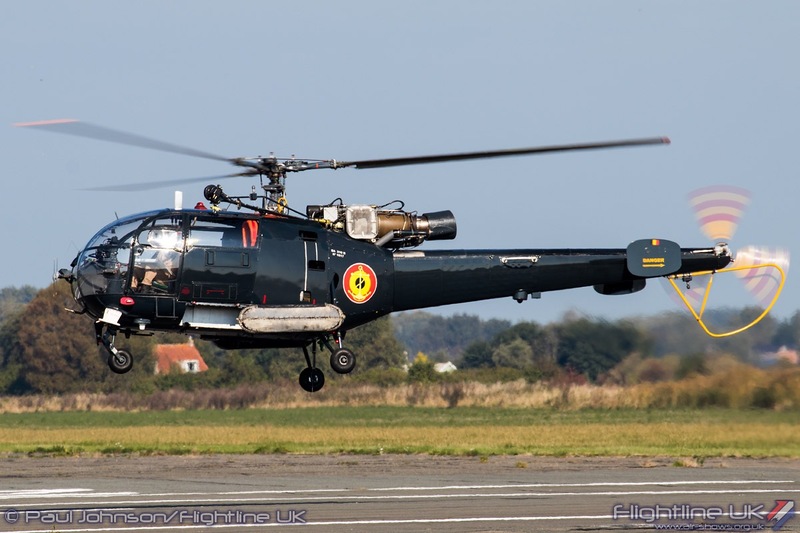 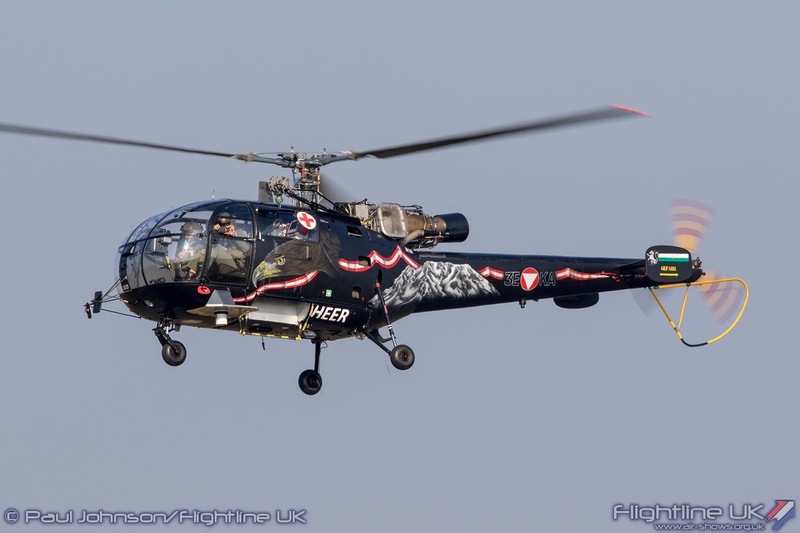 The second and last visiting aircraft was another Sud-Aviation SA316B Alouette III, this time from the Austrian Air Force. 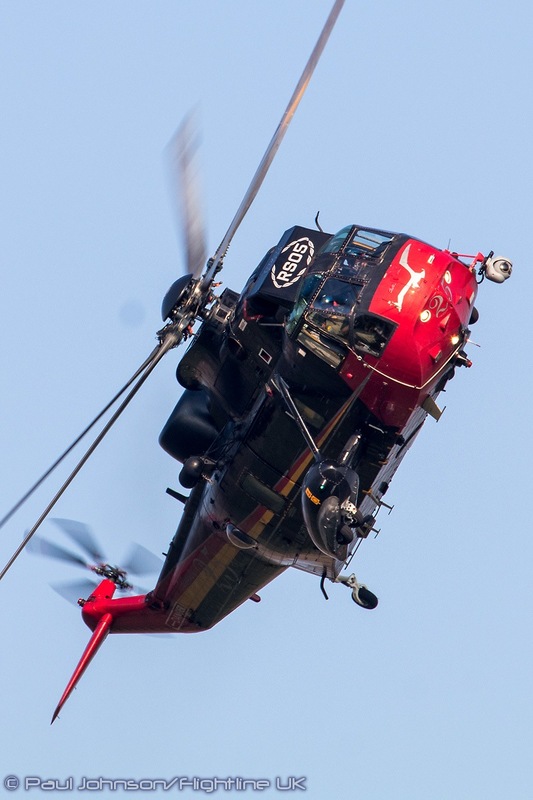 Operated by the Luftstreitkräfte, the Alouette III is used for a variety of civil contingency tasks such as Alpine rescue and firefighting within Austria. 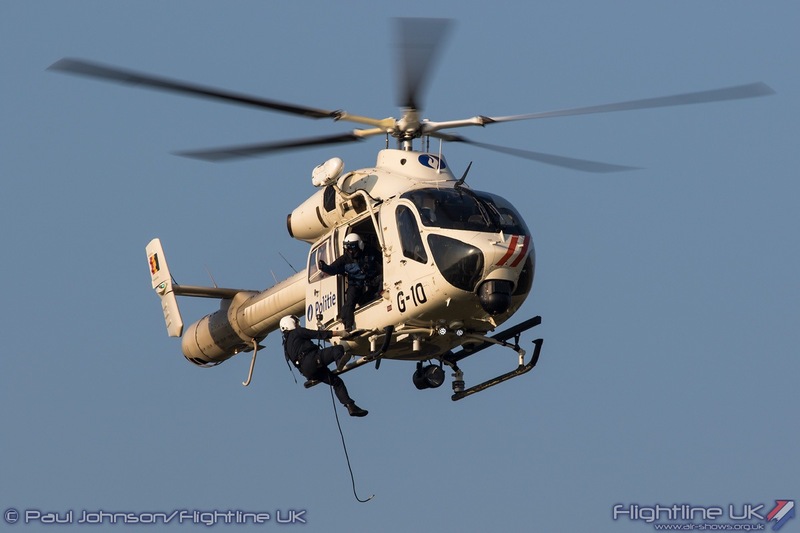 They are also deployed for Search and Rescue tasks in Bosnia-Herzegovina. 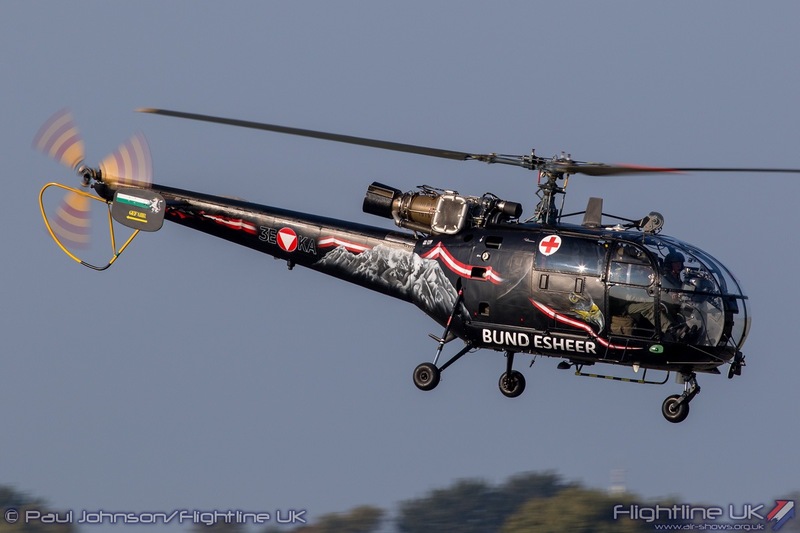 The Alouette III entered services with the Bundesheer in 1967 and next next will celebrate 50 years of the service in Austrian hands. 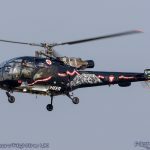 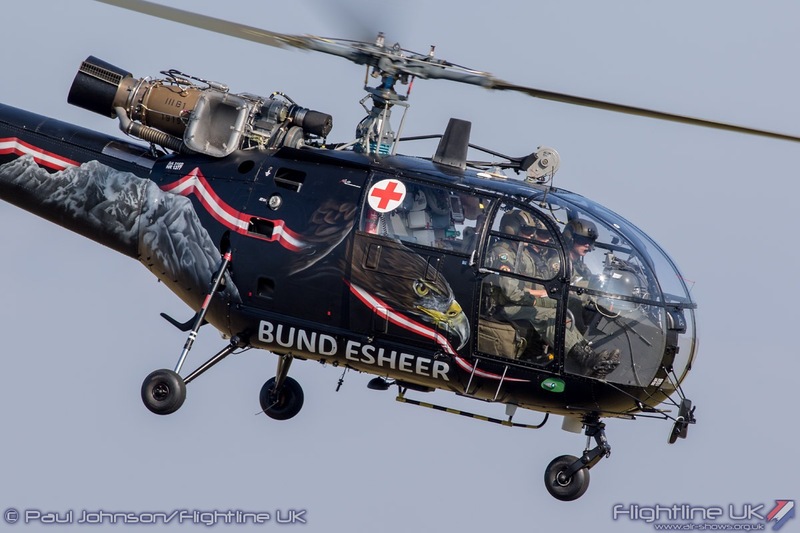 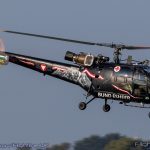 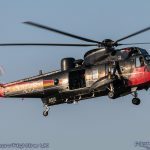 The example participating at SAR Meet wore some stunning special markings combining an eagle with the Austrian national colours making it perhaps the favourite participant for the photographers. 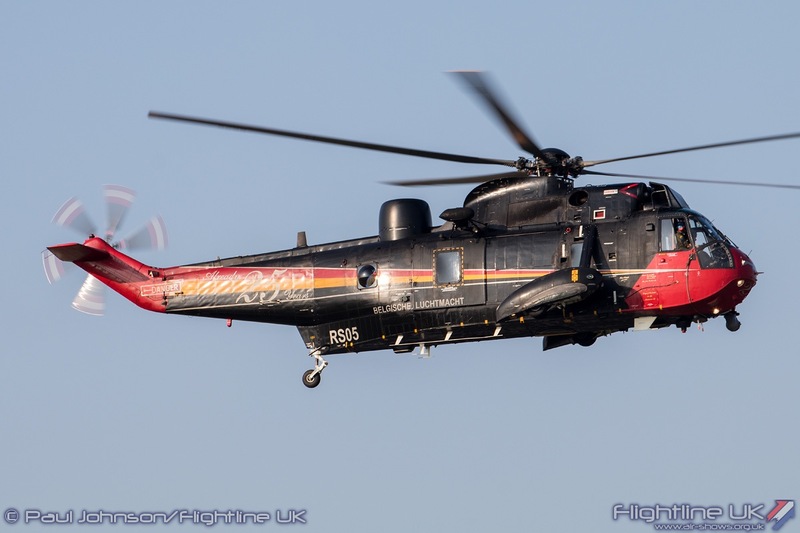 The final two aircraft to appear were from the home team. 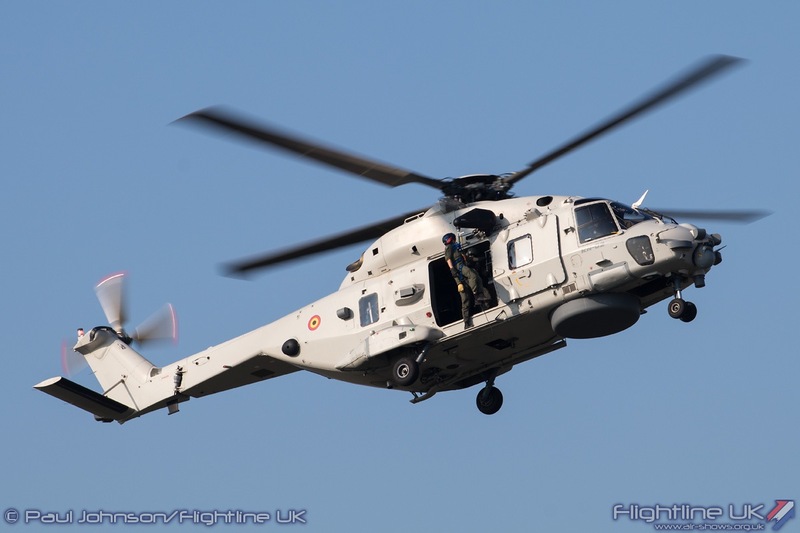 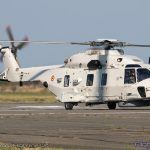 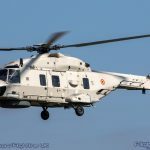 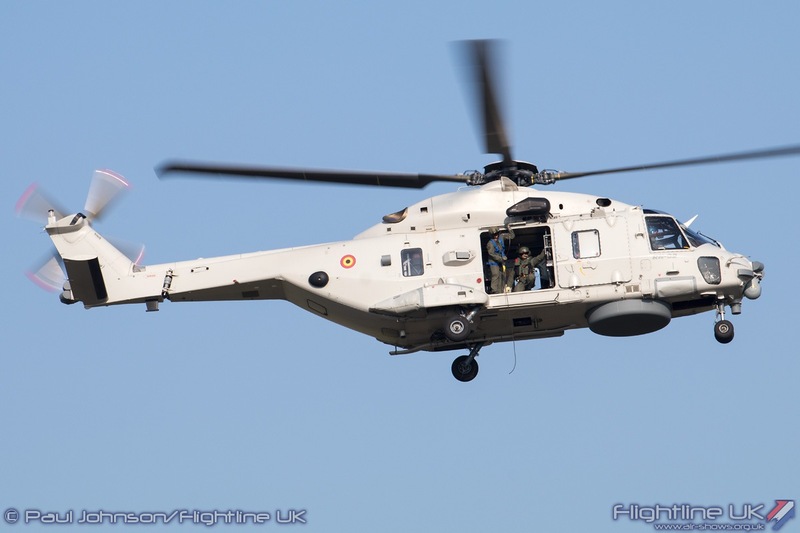 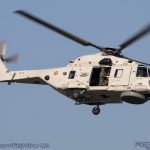 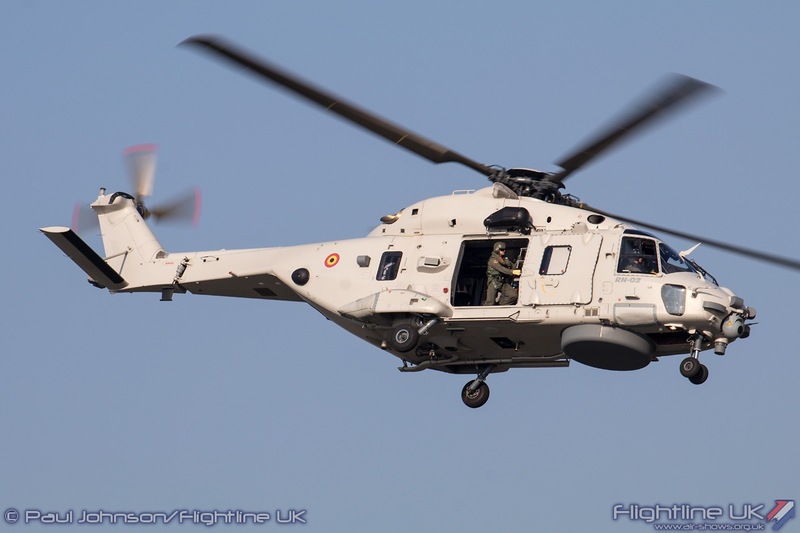 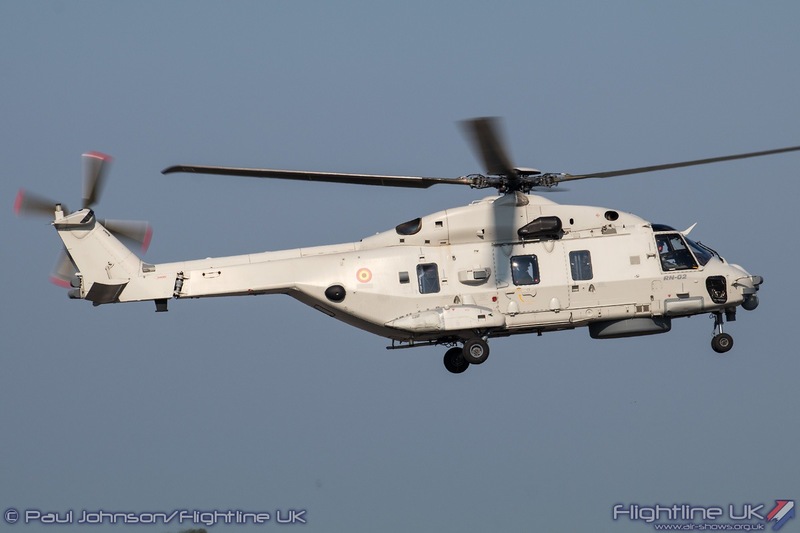 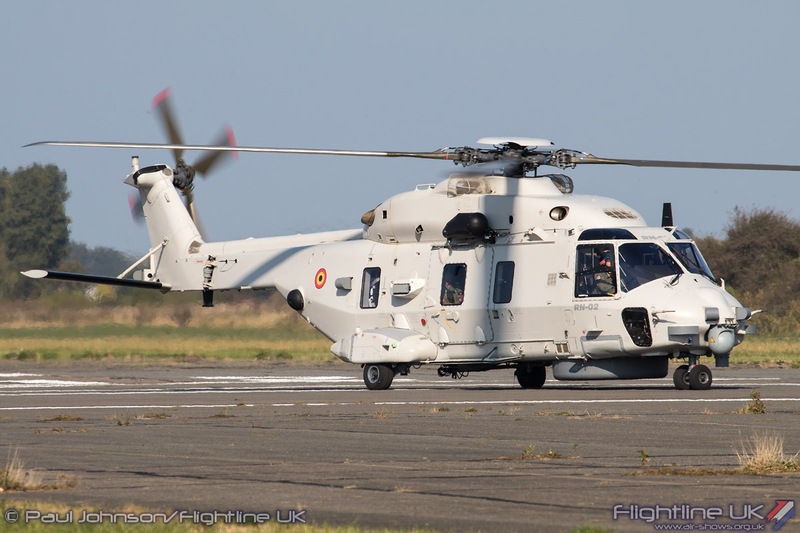 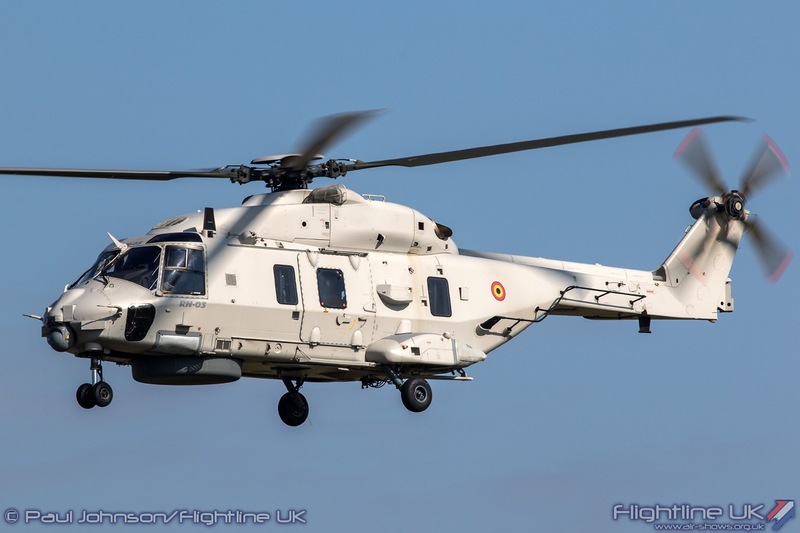 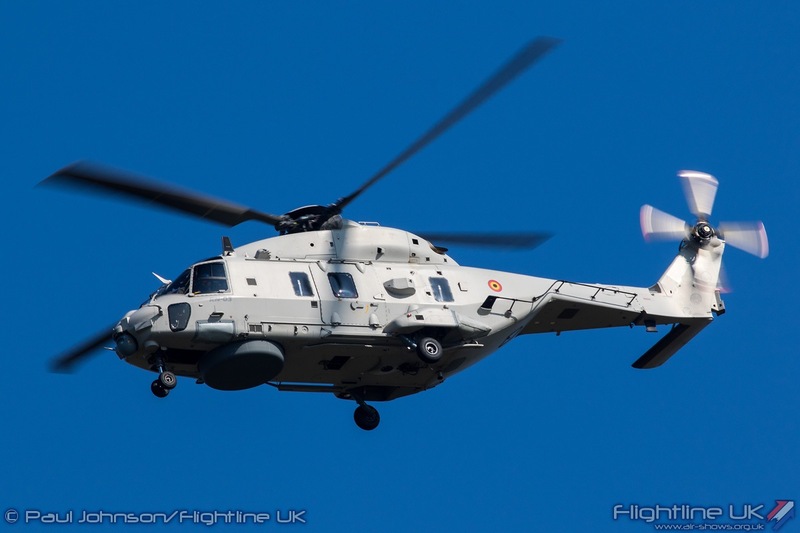 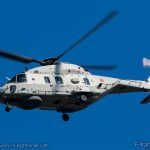 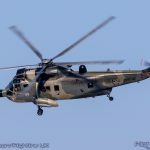 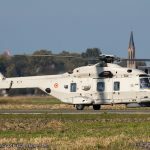 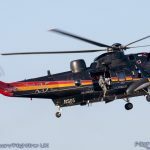 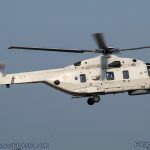 First to go was the NH Industries NH90NFH. 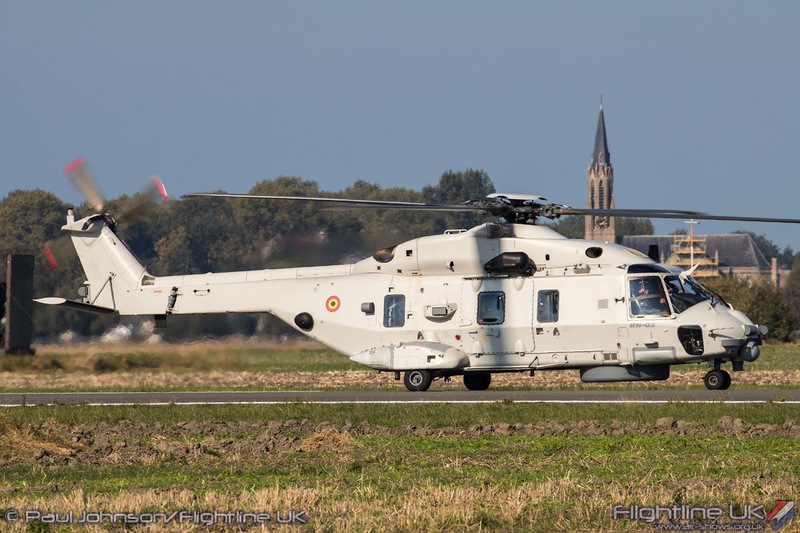 The Belgian Air Force operates a small mix force of NH90s. 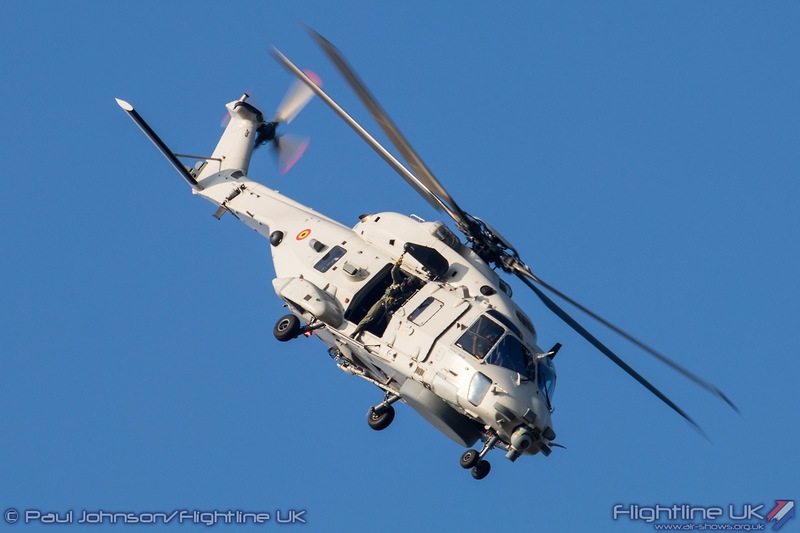 The NFH variant (NATO Frigate Helicopter) is optimised for maritime operations and will eventually take-over all of 40 Squadrons tasks. 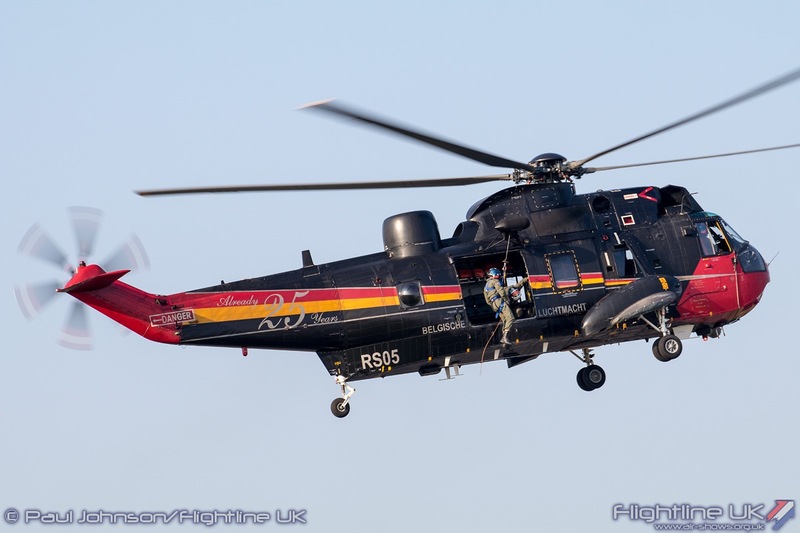 Also in Belgian Air Force service is the TTH (or Tactical Transport Helicopter) which is based at Beauvechain Air Base alongside the Agusta A109BAs. 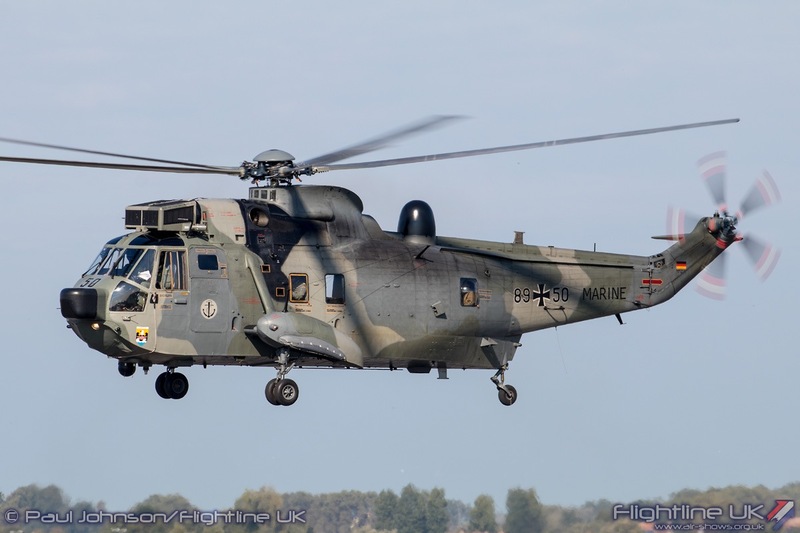 The final helicopter to depart on the Navigation task was the Westland Sea King Mk48. 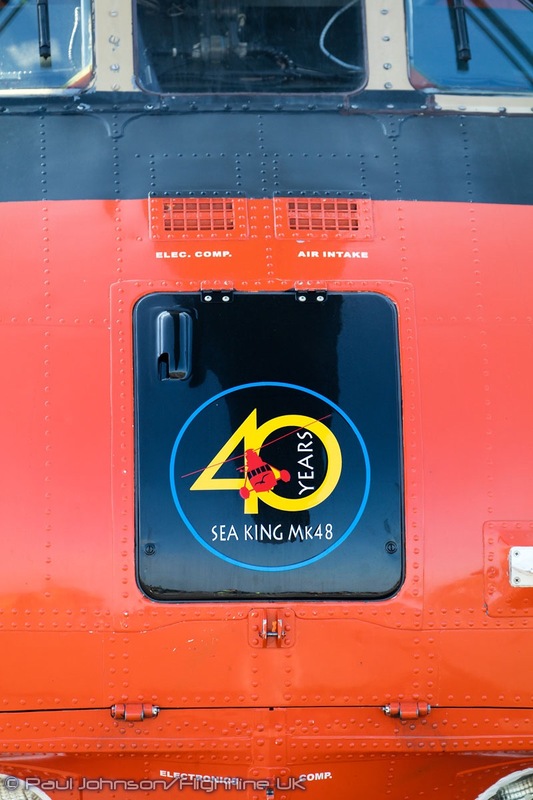 The aircraft was RS05 which wears some very patriotic special markings which were applied to celebrate 25 years of Sea King operations! 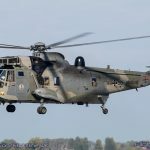 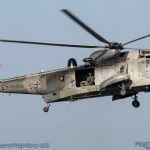 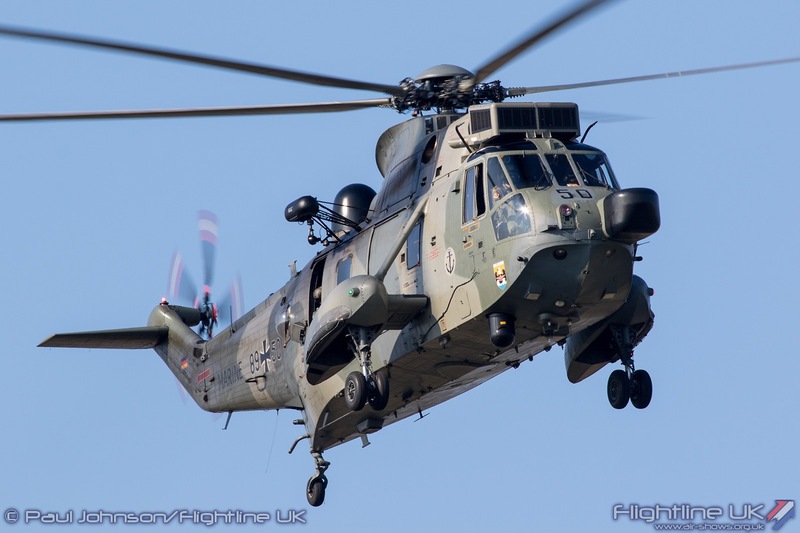 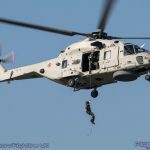 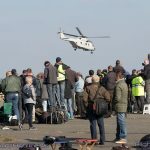 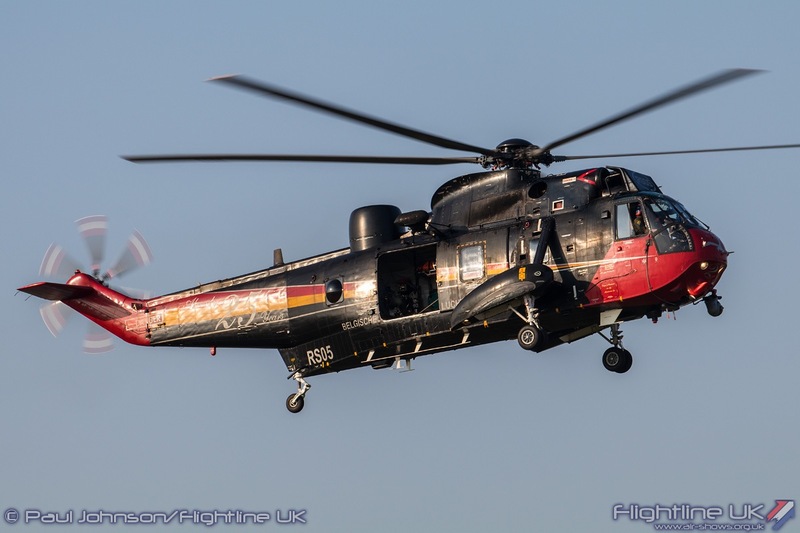 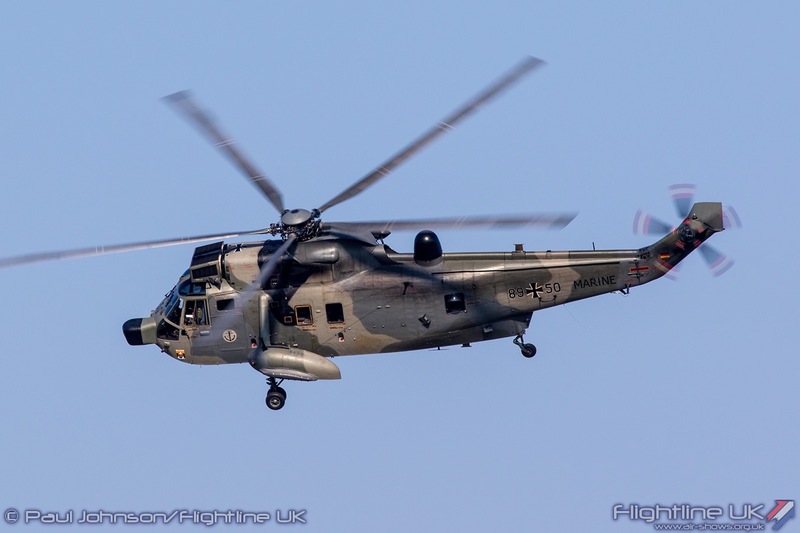 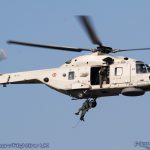 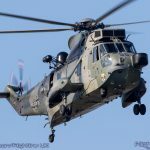 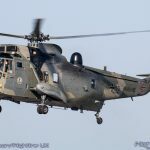 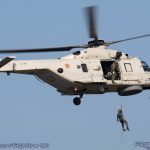 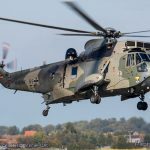 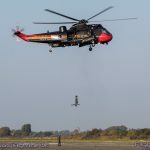 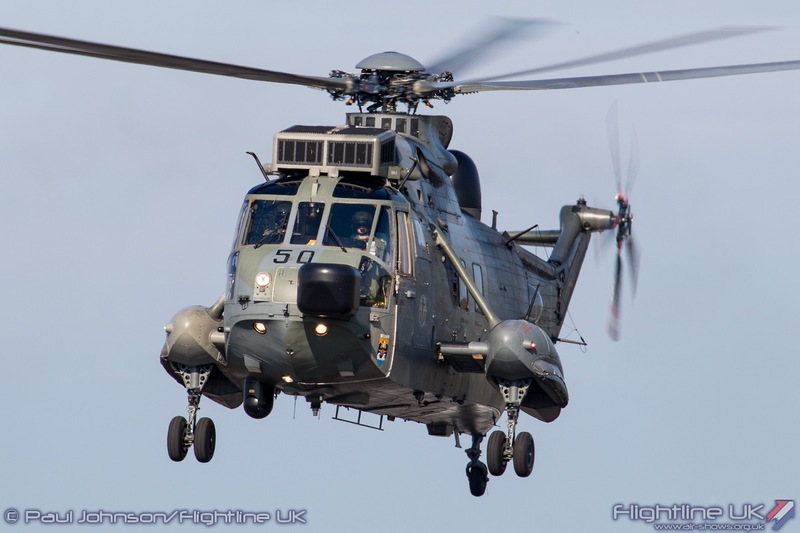 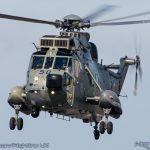 On their return to Koksijde, both the NH90NFH and Sea King Mk48 performed search and rescue role demonstrations for the audience in the enclosure which ensured a very fitting finale to the day. 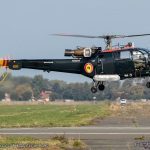 The various cancellations were frustrating and disappointing for both organisers and enthusiasts alike. 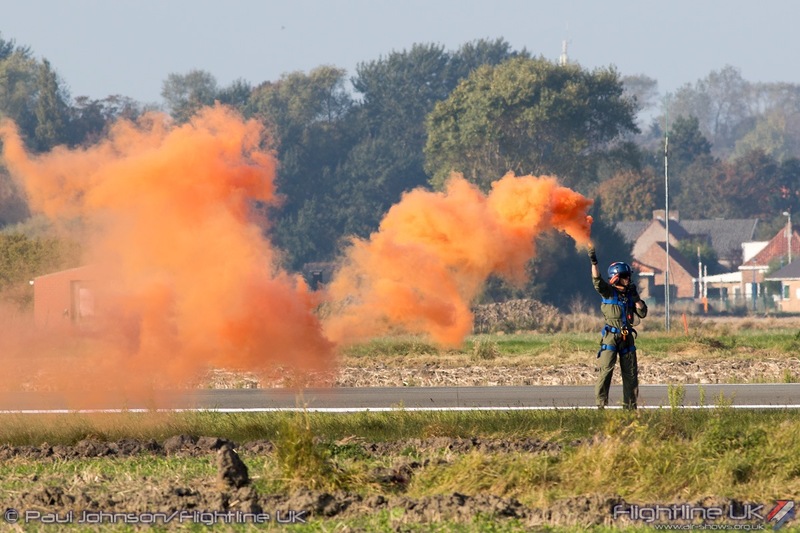 However, the brilliant autumnal sunshine, great organisation and friendliness of the welcome to Koksijde plus some dramatic flying ensured it was a very enjoyable and worthwhile day for all the attendees.